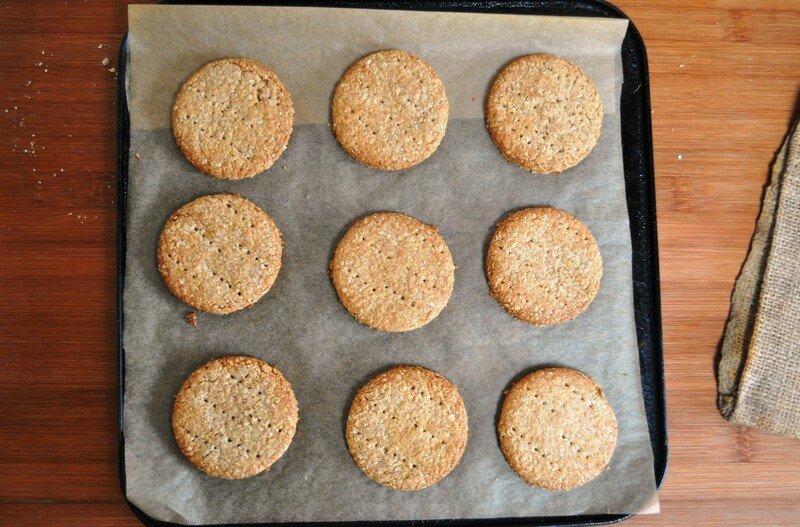 Apparently this type of biscuit was first developed by two Scots doctors in the early 19th century who believed the bicarbonate of soda was the digestive aid. 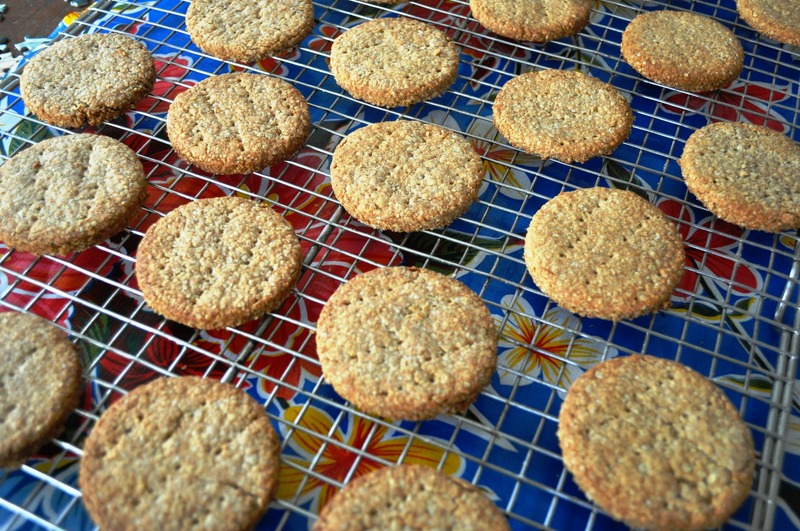 These days, however, we’re more likely to look to the bran, from wholemeal wheat flour, and the oatmeal, for the more healthful qualities of digestives. This is another one of my recipes from my old notebooks from when I lived at Old Man Mountain, New Zealand, in 1994-95, from my friend Nadia. I’ve no idea where she got the recipe from. If memory serves, it was in one of her notepads. All I know is we were making a baked cheesecake, needed some digestives, and this was a better option than driving 15km to a shop. This time round I’m making them because I want to try this amazing looking, amazingly indulgent recipe from Kate “The Little Loaf” Doran. 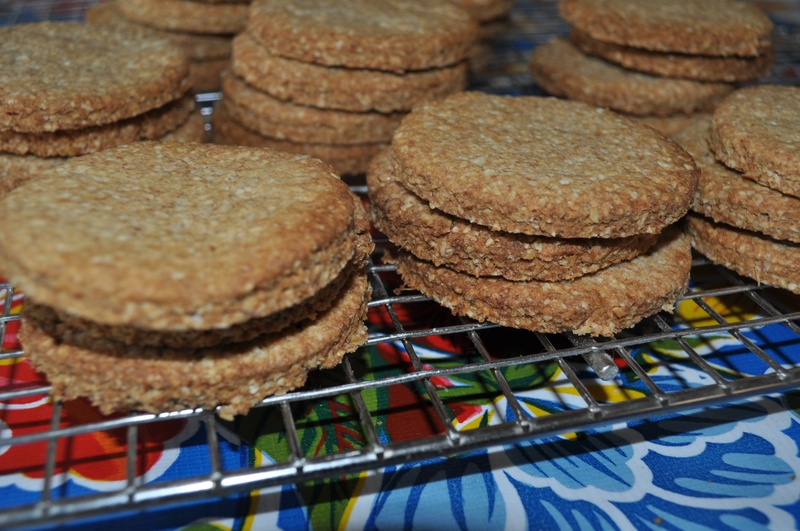 Kate has her own, similar recipe, for digestives, but well, I wanted to use mine, another memory of Nadia. This is a slightly tweaked version of the one I’ve got in my notepad. That one used baking soda, aka bicarbonate of soda aka sodium hydrogen carbonate, for a little bit of raising agent. The thing about baking soda, though, is that it’s an alkali and it needs an acid to react with to create the carbon dioxide that gives lift. That’s why US muffin recipes, say, often include yogurt, for the lactic acid. Other recipes might use citrus juice, milk or even vinegar. But my old digestive recipe had nothing acid in it*. So I’ve replaced the baking soda with baking powder. And what is baking powder? It’s pre-mixed combo of baking soda and something acid for it to react with when you combine and bake. In this case, sodium phosphates: that is, sodium salts of phosphoric acid. A word on the oatmeal: you can use whatever you fancy, though fine or medium are probably best. I didn’t have any, so I just used some porridge oats, which I whizzed in a food processor – to make a medium-coarse meal. Hence the results in this case are especially rustic. 2. 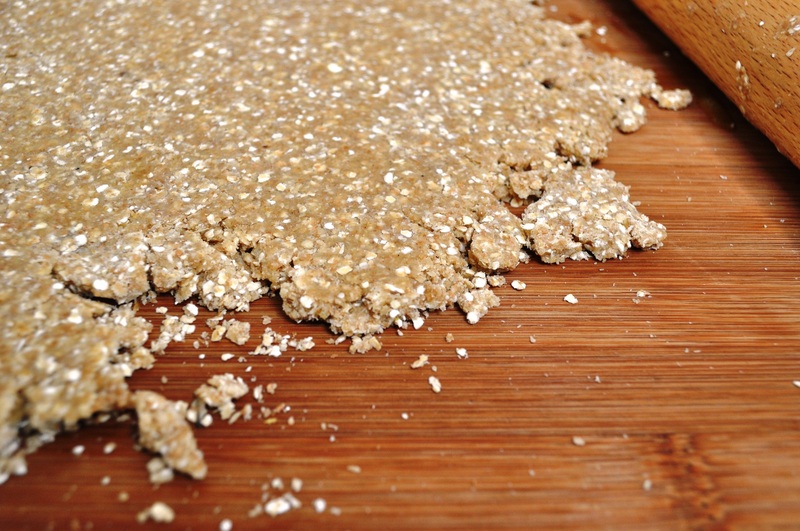 Combine the flour, oatmeal, salt and baking powder in a bowl. 3. 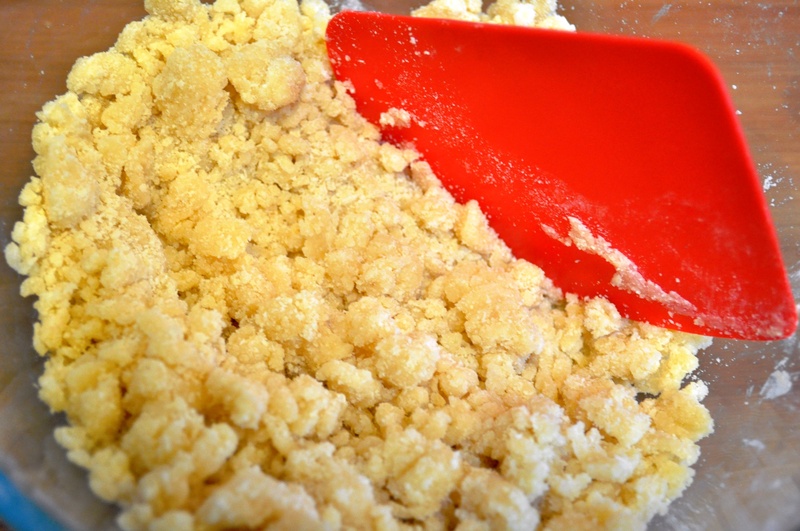 Rub the butter into the flour mix until it resembles crumbs. 5. Bind with the beaten egg, to form a rough dough. Don’t overwork it, or you’ll toughen it up. You can wrap it in plastic and give it a rest in the fridge at this point, but I can’t say I noticed the difference. 6. Roll out (or indeed “pin out”, in British baker parlance) to about 5mm thick. It’s quite crumbly. 7. Cut circles of about 70mm diameter. It doesn’t matter too much if you don’t have this size cutter; you could even just use a glass. 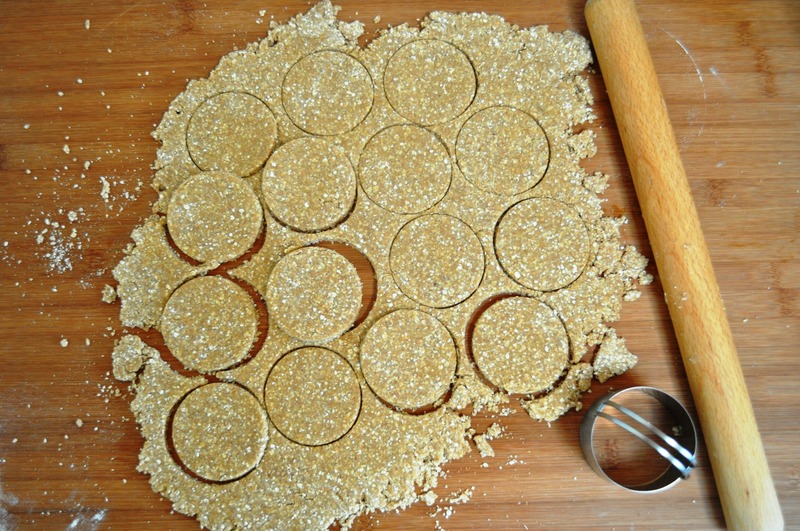 Bring together any scraps, roll and cut circles to use it all up. 8. 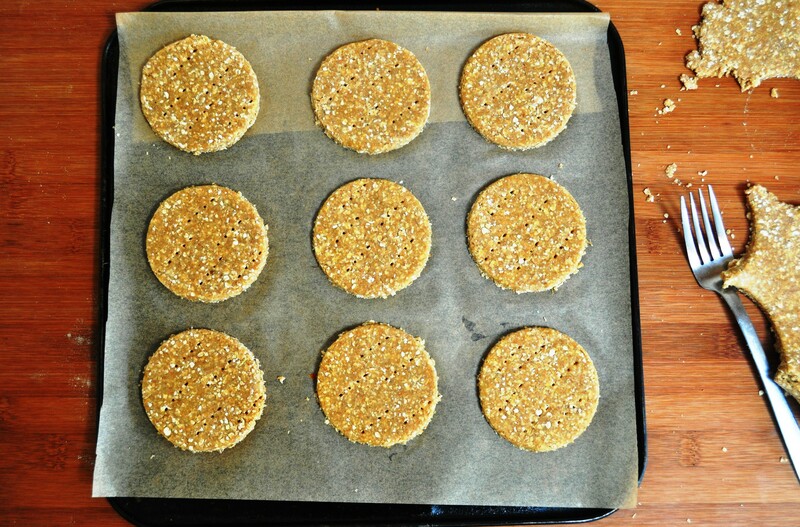 Put on lined baking sheet, dock or prick with a fork. Sprinkle with extra oatmeal if you like, but I find it mostly just falls off. 9. Bake until browned, around 15 mins. 10. Cool on a rack. 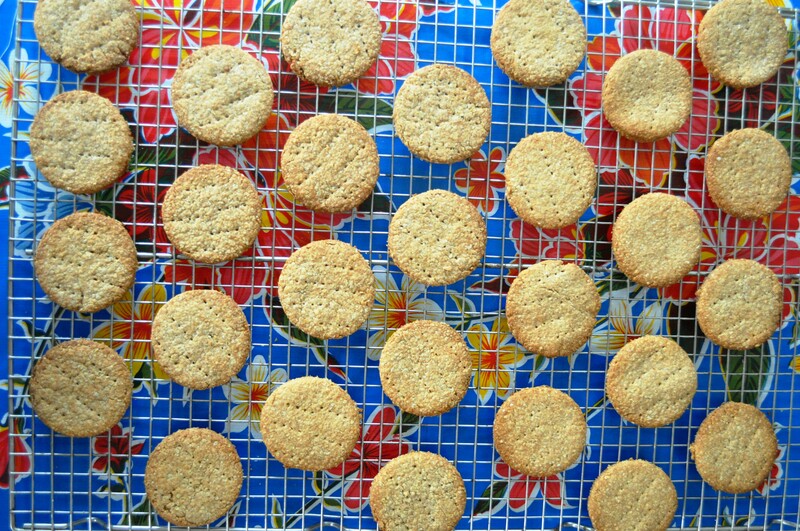 They’re excellent with cheese, dunked in hot chocolate, or used for a cheesecake base. This recipe is from one of my old notepads, dated 1994. At the time I was living at Old Man Mountain, on the South Island of New Zealand. My hosts there were Susie, who owned the farm, and Nadia, who lived in the yellow house by the highway that wended its way on down the rugged Buller Gorge. Nadia was one of the great food influences on my life, one of the three women who taught me about cooking, alongside my mother and Delia Smith1. Despite living in the middle of nowhere in a sparsely populated country adrift in a massive ocean, Nadia had a voracious interest in food, and loved working with young international enthusiasts like me who came to visit, learn and share. She had a great cookery book library too, and we would spend hours chatting about food – either while making meals for Nadia’s large family and whatever friends were passing by or planning parties or catering jobs. Such conversations, and poring over her cookery books, filled up pages in my journals from the period. Unfortunately, I wasn’t exactly assiduous in providing the sources of recipes. 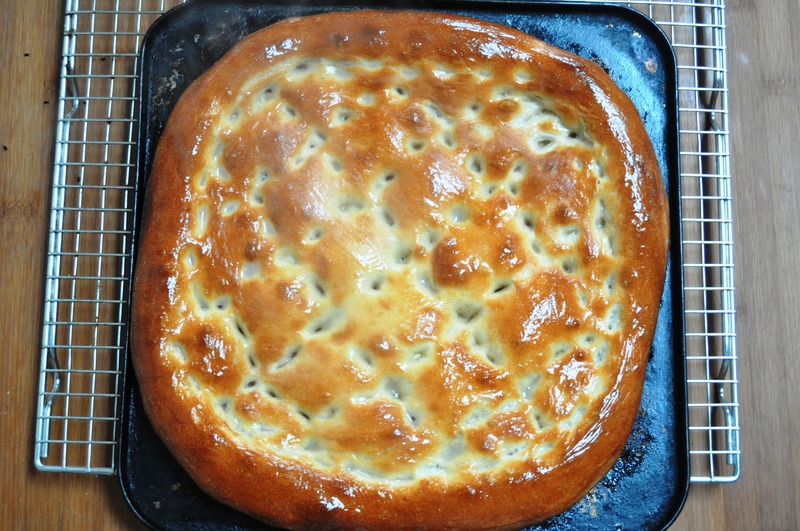 Sometimes I did, but not in the case of the two peda bread recipes I’ve got: this one, and another simply called Armenian peda bread. 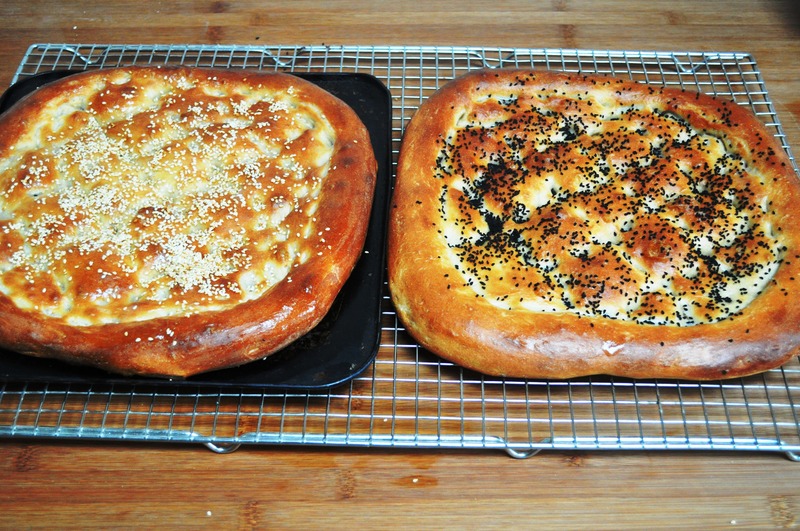 The word peda is clearly related to the Turkish “pide” and the more familiar “pita” but not only do I not know the source of the recipe, I can’t really help with the etymology or relationship between these words as no one is sure. There are various forms of flatbread that go by these names. Heck, the word pizza may even be in the same linguistic and culinary family, but I’d be spreading internet misinformation if I said that it was with any certainty. From a little research I do conclude that peda is the Armenian variation on the words pide and pita. And rather than being just a bread developed by Armenian-Americans in LA, this recipe looks like it’s a variation on matnakash. 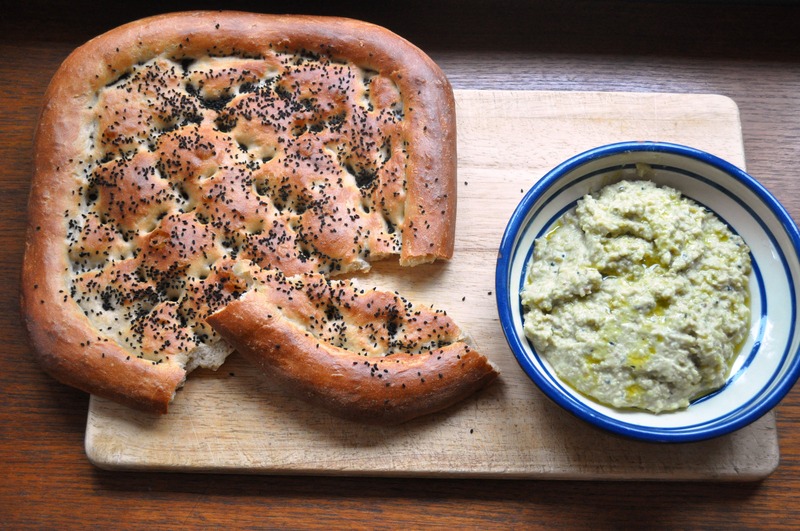 According to that dream-of-the-internet Wikipedia, matnakash means “finger draw” or “finger pull” bread, which fits in totally for this recipe as you stretch and pattern it with your fingertips. Mine look a bit different to the ones I can see online now. It’s no wonder though as I’m a white Briton who learned to make them in New Zealand with the encouragement of a Maori-Indian-pakeha woman, from a book with no pictures, in an era when it wasn’t possible to just go online and check something. 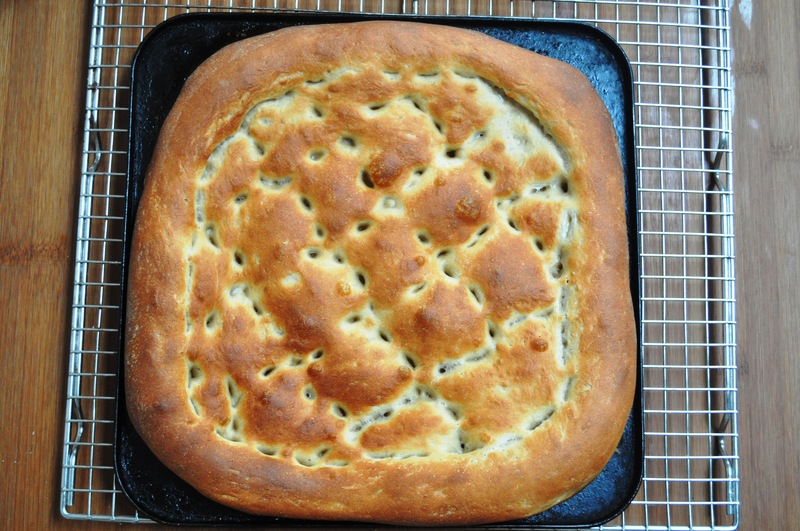 My version may not be authentic (a troublesome concept at the best of times) but it is personal, makes for a great sharing bread, and is a reminder of my amazing, energetic, knowledgeable friend and culinary teacher Nadia, who sadly died last year and is sorely missed. Bakers’ percentages shown in brackets. So this is a 64% hydration bread, with a nice, manageable dough. I would also say that at 4.3%, this recipe contains too much yeast and rushes the fermentation. My normal bread recipe contains 2% yeast. However, I really just wanted to try out the recipe from my old notepad, and convert it into grams from cups. In future, I plan to try it with less yeast or with a sourdough starter, or a preferment, and a proper long fermentation, for flavour and digestibility. 1. Mix the sugar with the warm water, sprinkle on the yeast and leave it to activate. 2. 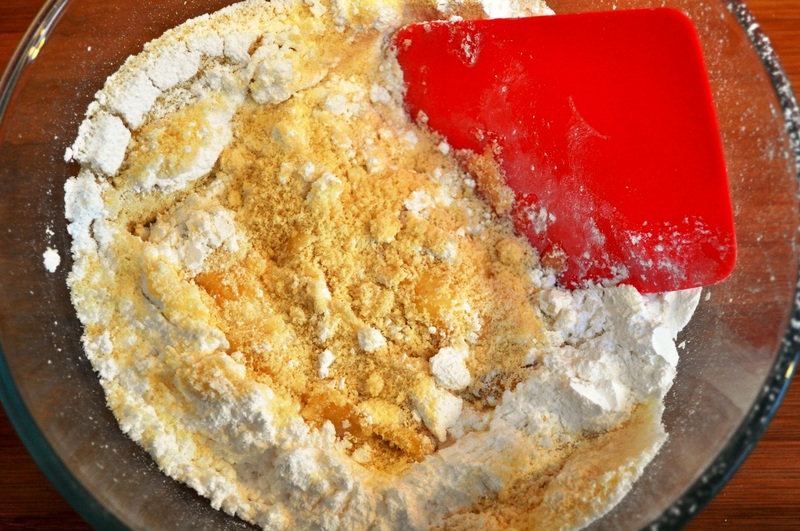 Put the flour in a large bowl, add the salt and mix it through. 3. 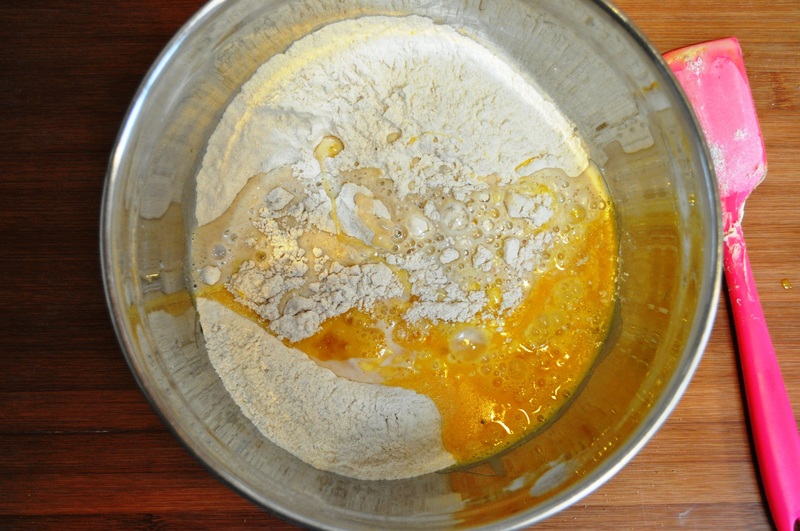 When the yeast mix is frothy, add it to the flour, along with the melted butter. 4. 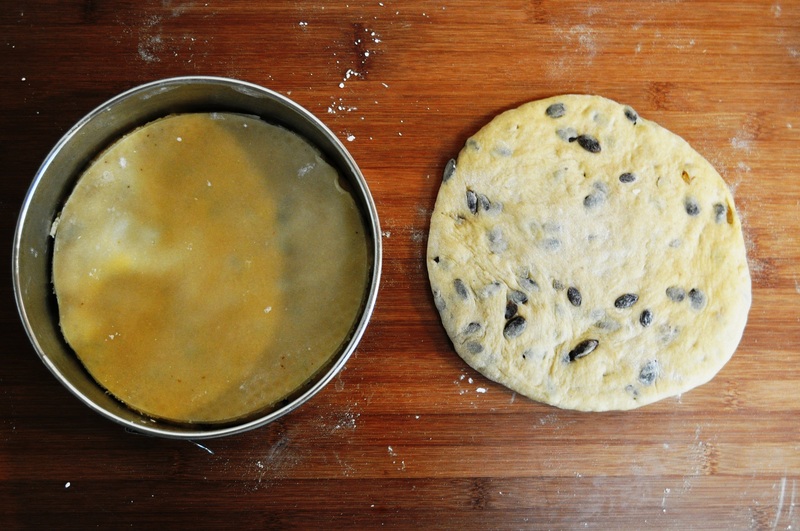 Bring the dough together, turn out and knead until smooth. 5. Form a ball, put in a clean bowl, cover and leave to prove until doubled in size. With this amount of yeast, it won’t take long. Mine took about an hour at RT of 18C. 6. 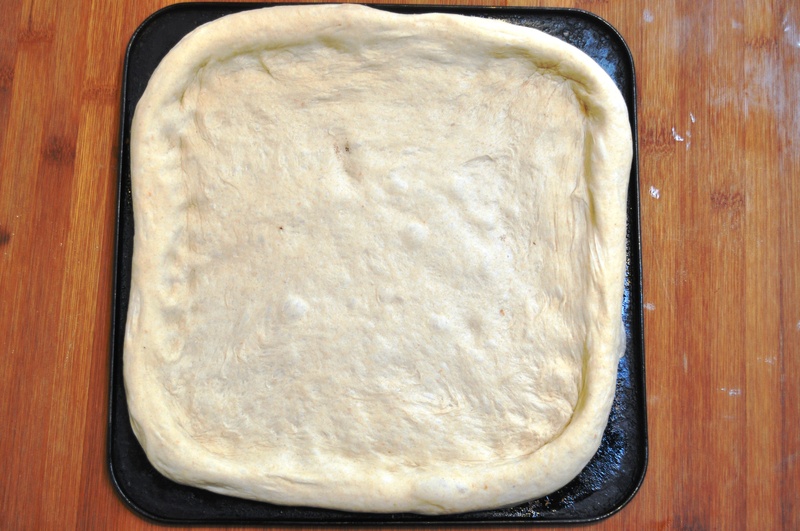 Divide the dough into two pieces. Mine weighed 1225g, so two at about 612g. 7. Form the two pieces into balls. 8. Grease two baking sheets with oil, then put the balls on them, cover and leave to rest, for about quarter of an hour. 9. Stretch out the balls to fill the shape of your baking tray. My trays are square but the traditional shape for matnakash is more rectagular2. Form a rim, or edge with your fingertips. 10. Cover with a damp cloth and rest again, until doubled in size. 11. Brush with water then form a criss-cross pattern with your fingertips. 12. Cover with a damp cloth and rest again, until doubled in size. 13. Preheat the oven – to about 220C if possible. Mine can only really muster about 200C, disappointingly, but it’s OK.
14. Bake the flatbreads for about 15 minutes or until nicely browned. 15. 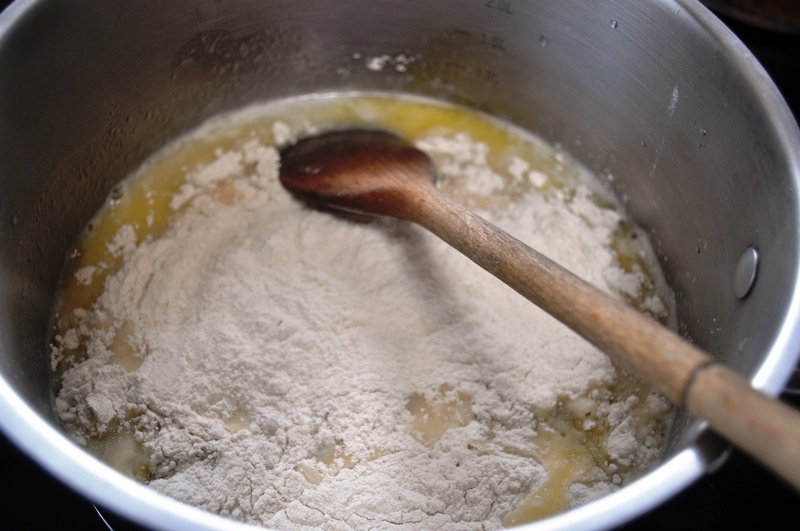 Make a flour glaze by putting 2 teaspoons of flour in 100g of water and bringing to the boil, whisking. Brush this onto the breads as soon as they come out of the oven, and sprinkle with seeds, such as sesame or nigella/kalonji. I enjoyed mine with a dip (top pic) made from dried English peas. I’ve noticed since coming home from Italy, where I was able to buy Italian-grown lentils, chickpeas and other dried legumes, that most available here are imported from China. That seems crazy: it’s too far, too dubious. Sure different crops grow here compared to Italy or France, which also grows a lot of lentils, but pulses were a staple here for centuries: just think of generations of Britons partially subsisting on variants on pease pudding. Luckily, a young-ish British company was thinking along similar lines, and now grows peas and various beans, including broad beans (sold as fava), here. They’re Hodmedod’s and I wish then every success, as not only are they supporting British food production, they’re reinvigorating ancient culinary traditions. And they have cute branding too, even including little recipe booklets in their packets of produce. 1. Delia Smith is not fashionable now – in fact, she was never exactly trendy. But in the Complete Cookery Course, since its first appearance in print in 1978, taught me so much. It was the default book for a child growing up in that period interested in learning the basics in pretty much any area of cooking, from stews to pastries. 2. In Armenia, matnakash and the unleavened lavash would be made in a tonir, the Armenian equivalent of a tandoor. March 19th is the feast day of San Giuseppe – Saint Joseph, husband of Mary, Jesus’ mum. For this feast day Italians eat various goodies including bignè and zeppole, types of sweet fritter. 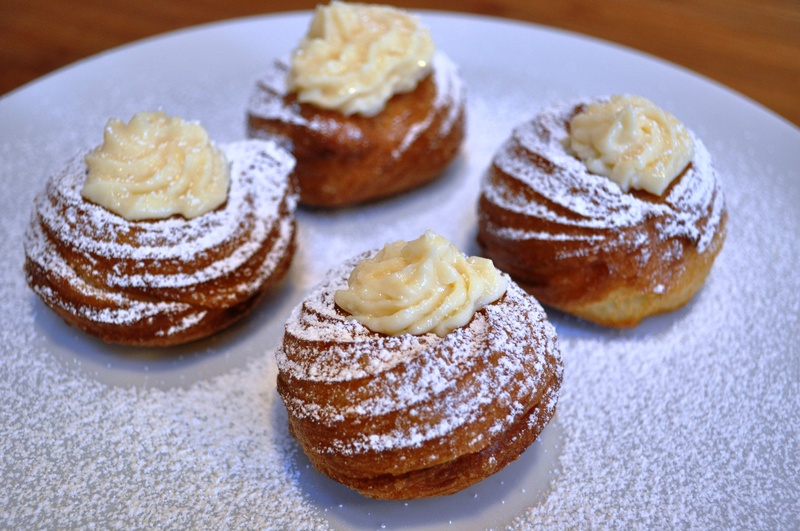 This recipe is a modern take on zeppole di San Giuseppe. Or are they bignè di San Giuseppe? The two terms seem to sometimes be interchangeable, but one distinction between the two seems to be as follow. Bignè are choux balls filled with pastry cream (crème patissiere, or crema pasticcera in Italian). 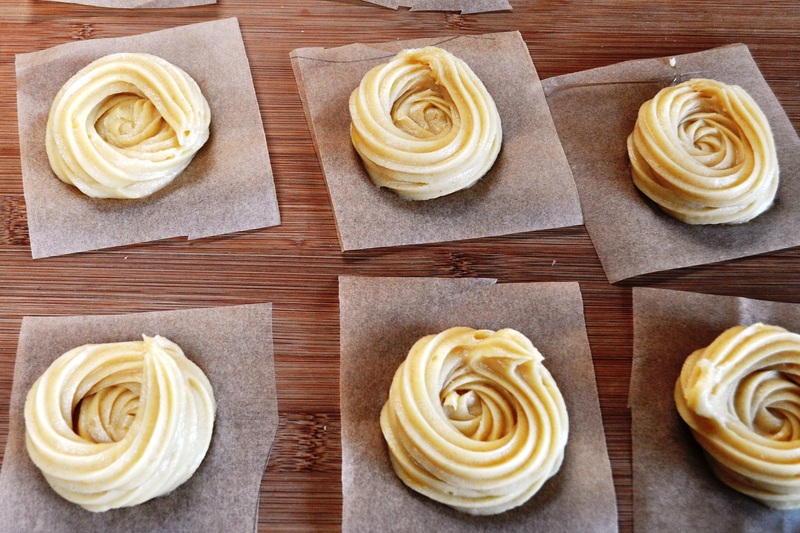 Zeppole on the other hand are choux piped in nest shapes that are then filled with pastry cream. Both are cooked by deep-frying. Except when they’re baked. Different regions and dialects may use the words bignè and zeppole differently. Furthermore, in Gillian Riley’s Oxford Companion to Italy Food, she says in her entry on zeppole: “The sfinci of Sicily are similar”. She doesn’t discuss the similarities or otherwise with bignè. The word is clearly related to the French beignet though. Ah, the confusing world of the taxonomy of traditional foods! Either way, these fritters are made and eaten for St Joseph’s Day. Except, however, I recall seeing them in Rome several weeks before St Joseph’s day, sitting alongside castagnole during Carnival and, if memory serves, remaining available until Easter. So much for the Lenten fast. It’s not unlike the modern British habit of eating hot cross buns for the six weeks preceding Easter, when originally they were made and eaten only on Good Friday to celebrate the end of fasting. 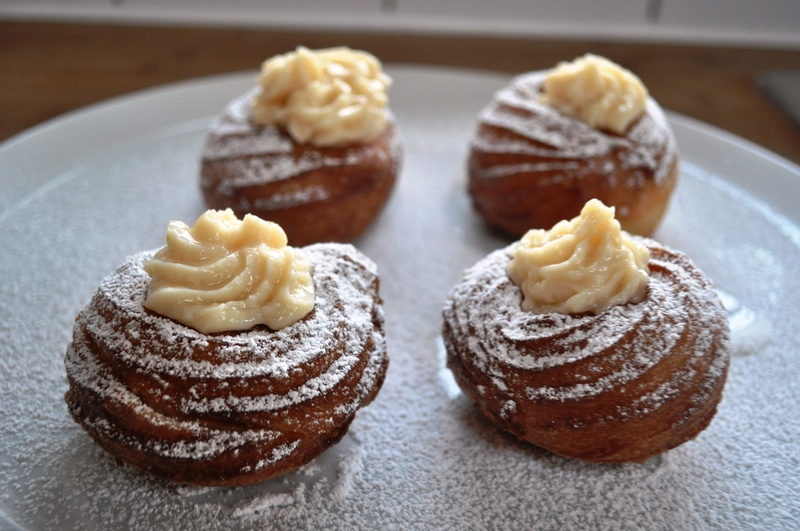 I was planning to make something that would these days, in Rome at least, be called bignè – a filled choux-ish item. But as I fancied practicising my (very rusty) piping skills I sidestepped to what would now most likely be called zeppole. If any Italians are reading, please tell me what your family calls these things! 1. Put the milk on to heat up. 2. 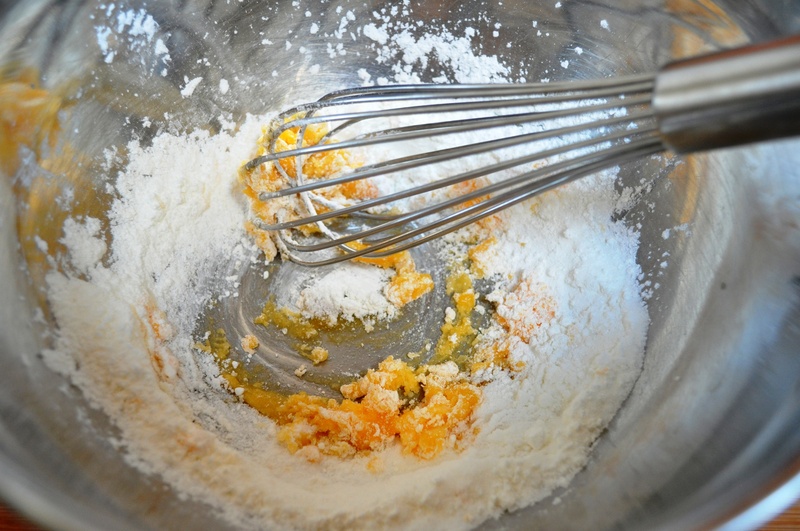 Beat together the egg yolks, sugar and cornflour. Add the vanilla, lemon zest, and Strega if using. 4. 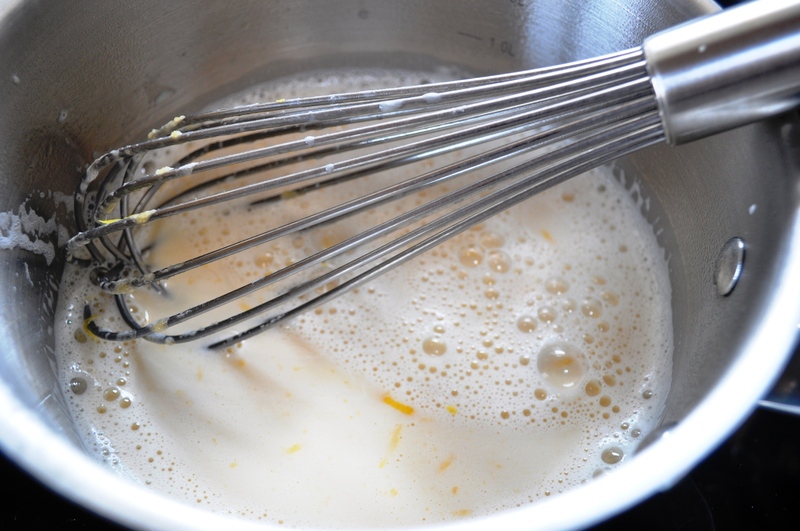 Allow the milk to cool slightly then pour it onto the egg mix, beating. 5. Put the mixture back on the heat. 6. Heat the mixture up again, gently, stirring all the time, and keep cooking on a medium heat until it thickens. This shouldn’t take long – a matter of minutes. 7. Pour out into another clean, cool bowl. To prevent a skin forming, dust with icing sugar and/or put some plastic film on the surface. 8. When cool, refrigerate until you need it. Let’s not beat about the bush. 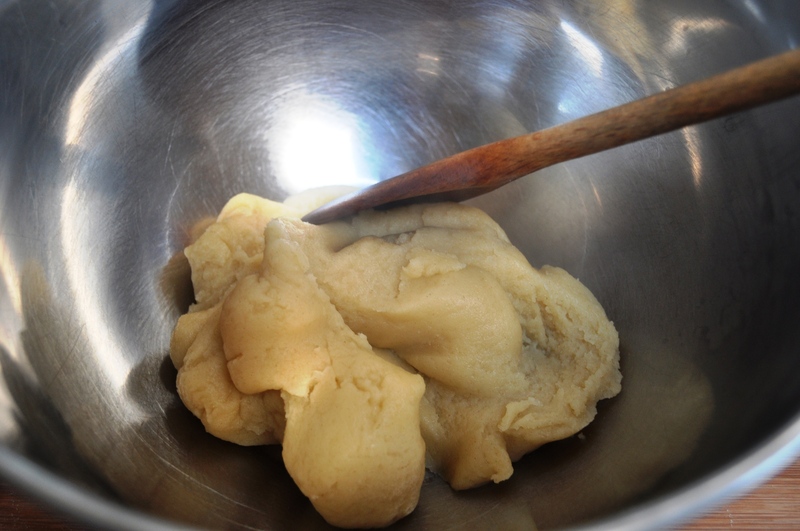 From looking at various Italian recipes really is basically a choux paste. 1. Put the butter, water and salt in a saucepan and heat up. 2. Bring to the boil, stirring with a wooden spoon. 3. When the butter has melted and the water is simmering, add all the flour (ideally sieved first), beating until you have a smooth paste. 4. Keeping cooking the mixture, on a low heat, for a few minutes. This gelatinizes the flour, ie makes the mixture gelatinous and jelly-like – it shouldn’t be sticky, and should come away cleanly from the sides of the pan. 5. 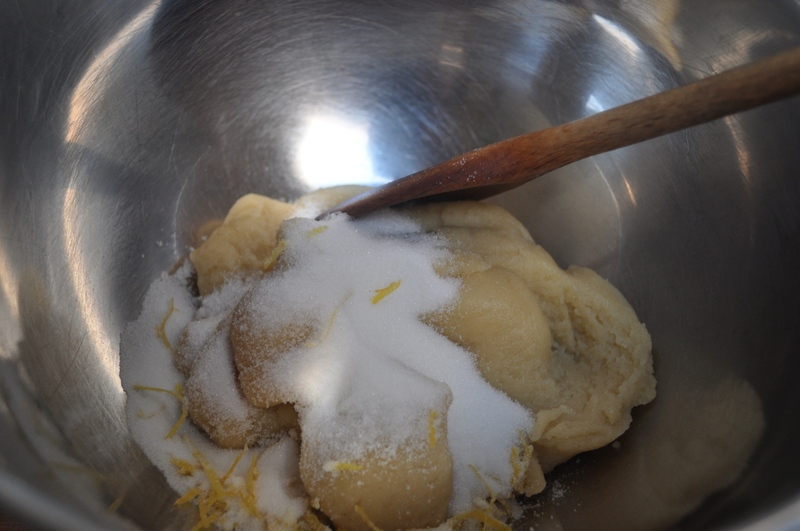 Remove the mixture from the heat, beat in the sugar and lemon zest, then put in a clean, cool bowl. 6. Allow the mixture to cool. If it’s too hot when you add the egg it will scramble. 7. Beat in the egg slowly and gradually. Each time you add some egg, mix it in completely. You may not need all the egg (QB). You want a thick paste, not runny. If you have a mixer, that’s great for making this type of paste. Mix well. 8. Allow to cool and rest. Sour cherries in syrup or glacé cherries… or not. See below. 1. 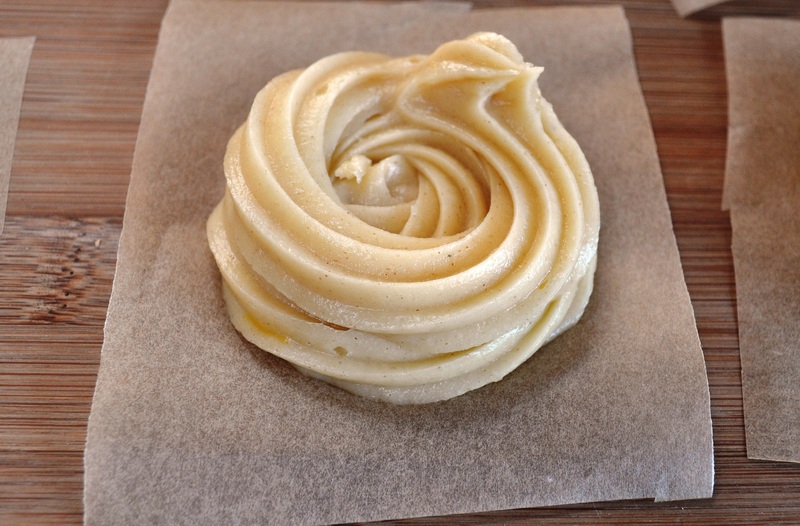 Put the paste in a piping bag fitted with a star nozzle. 2. Cut out squares of baking parchment or foil, about 8cm square. 3. Pipe nest shapes onto the squares. 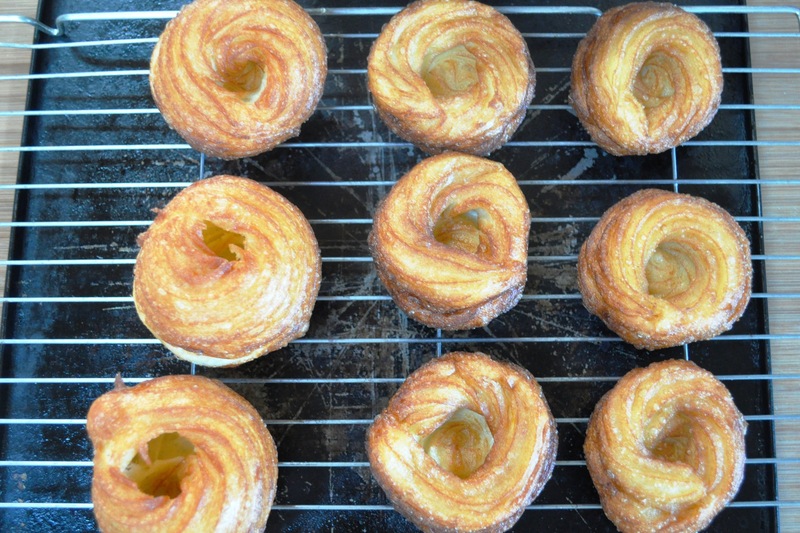 The older type of zeppole was simply a ring, but as we’re adding crème pat to these, you need a middle – so start by piping a spiral, then build up a slight wall around the edge. 4. Heat sunflower oil in a pan to about 170C and add the nests, paper and all. Don’t overcrowd the pan. 5. The square of parchment or foil will come away. Remove it with tongs. 6. Keep cooking until the zeppole are a golden brown colour. 8. 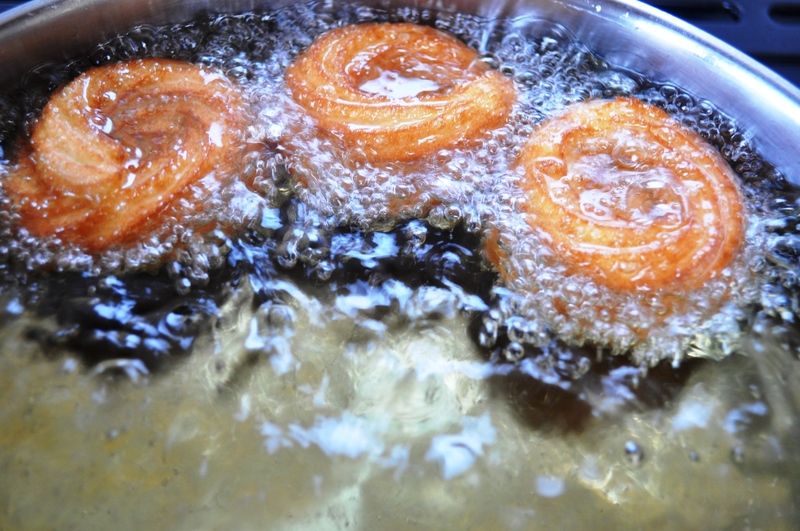 Once cool, pipe the crème pat into the centre of each. 9. You can top with a cherry. I hate cherries – sour, preserved, glacé or even fresh. Frankly: yuck. That would spoil it for me. So instead, I just dust with icing sugar. 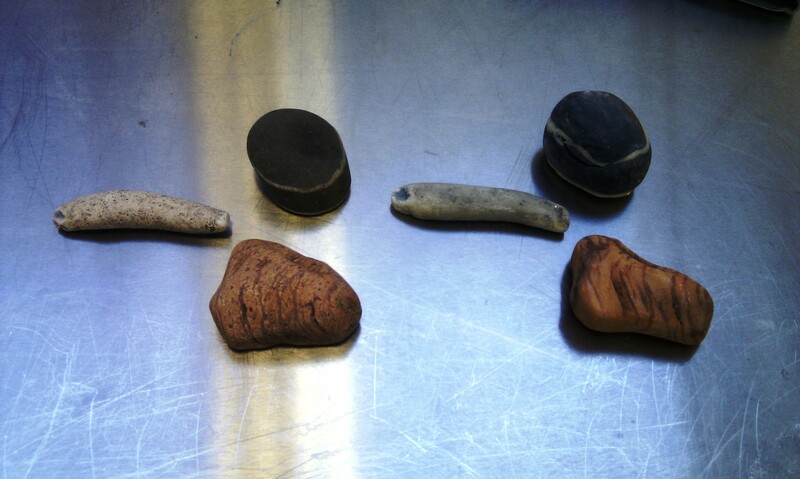 You may notice in the above pic my batches came out different sizes. The ones on the left puffed up best, on the right worst. It’s shoddy work I know. I suspect it’s to do with the oil not staying a constant temperature. Really must get a decent thermometer. Being a boy, obviously I want one of those ray gun ones (er, infrared). I’ll add it to the list of kitchen kit I covet. Hande Leimer is the founder and owner of Vino Roma, a wine studio – with an absurdly historic cellar – located in the centre of Rome. Not only is she an expert sommelier and polyglot wine educator, she’s an excellent cook too. And baker. When she posted a pic of her pear, chocolate and hazelnut cake on her Instagram a few weeks ago, I had to try it. These three ingredients make for a classic combination. I’ve always loved pear and chocolate, and indeed pear with chocolate sauce was a pudding I grew up with. But I also love anything made with ground nuts, so this really was a cake for me. Furthermore, Hande developed the recipe with the aim of balancing them, so no flavour dominated the other but each was clear and evident. The individual flavours are sharpened and delineated further with the judicious inclusion of some hot spice. She included piment d’espelette / esplenette pepper, but as that’s not easy to source in the UK, changing that is one of the tweaks I made. I think Hande also made hers in a loaf tin, but I favoured a round tin. I suspect my version is a little moister than Hande’s. I used local Concorde pears (a hybrid of Conference and Comice), which were firmly ripe, but still added a fair bit of moisture to the mix. 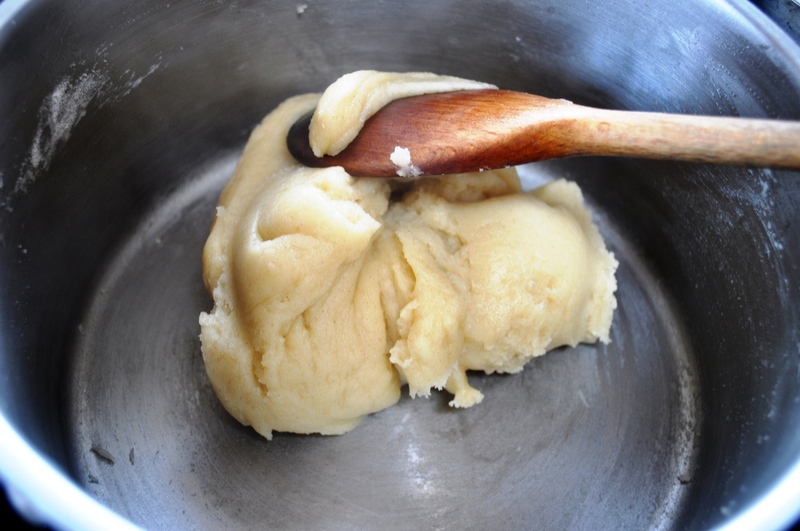 Hande said “I aimed for a batter that is not too runny but not too stiff either, when you pour it into the pan it does hold for a couple of seconds before gently flowing to all corners”, giving an optional 1 tablespoon of breadcrumbs if your batter was too runny. I didn’t do this, but instead increased the flour slightly. I also suspect I assembled mine in a different manner to Hande, but it’s one of those forgiving batters where the ingredients could be combined in various orders. 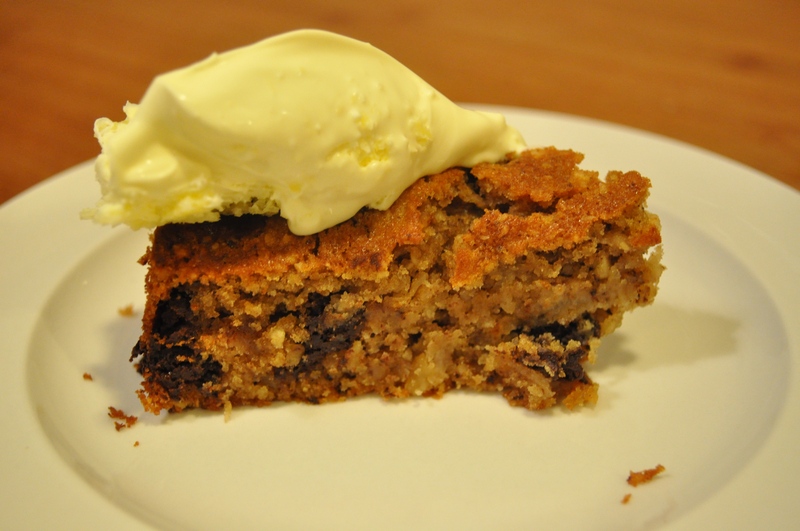 It’s not the sort of cake where you’re trying to achieve a super-light texture, instead it’s got a texture that’s defined by the nuts – crunchy, slightly oily – and the pears – moist, with the whole concoction shot through with bursts of dark chocolate. 1. Grease and line a 20cm round tin. 3. 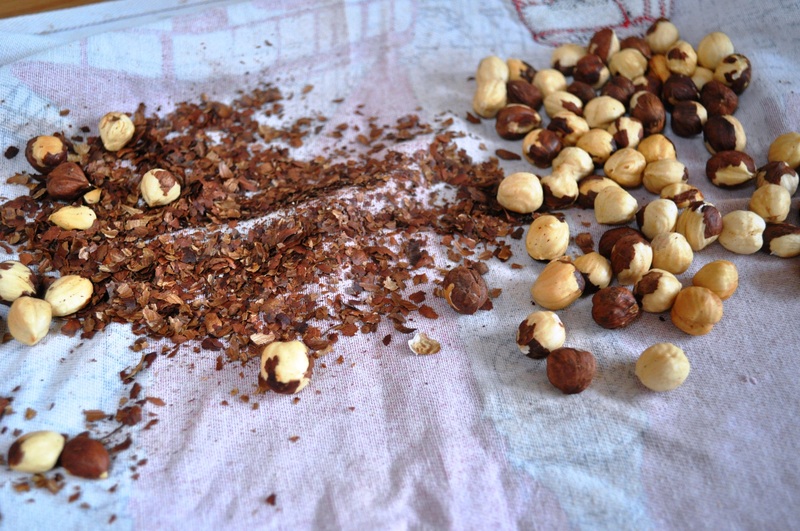 Lightly toast the hazelnuts, rub off the skins (using a tea towel or cloth; I wasn’t too assiduous about this – too many skins can be bitter, but a little adds flavour) and grind in a food processor to a medium meal. 4. Coarsely chop the dark chocolate. 5. 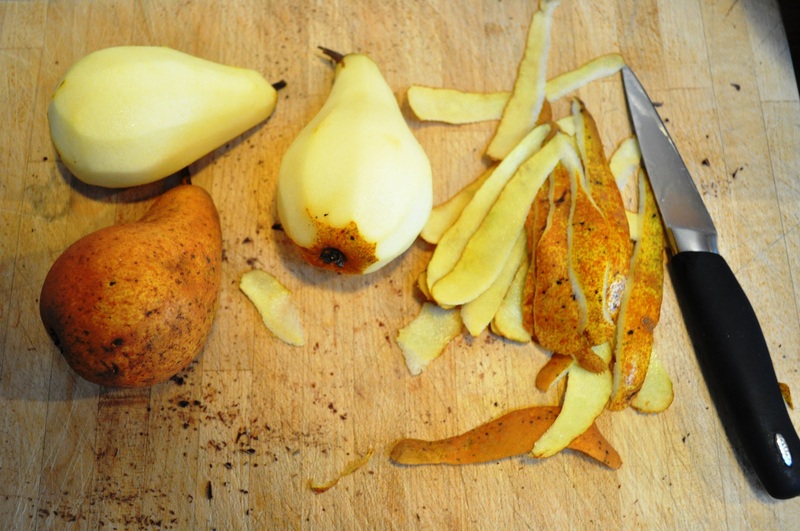 Pear, core and coarsely grate the pear. 6. Sieve together the flour, baking powder and spices to mix. 7. 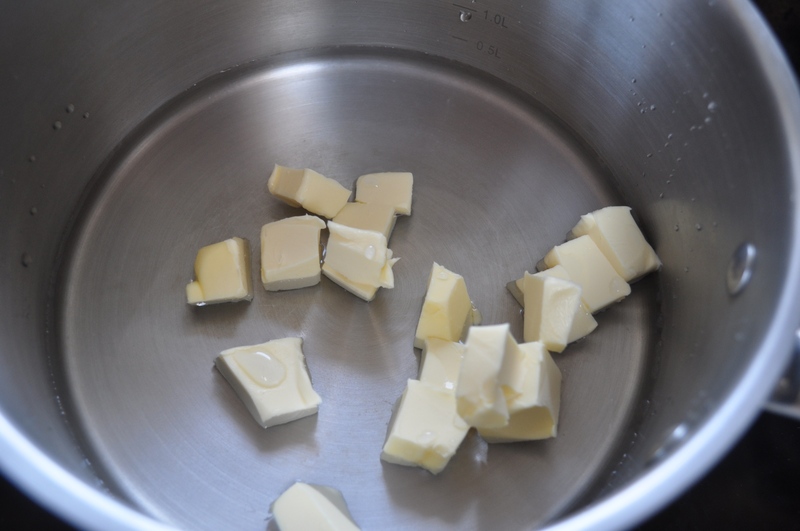 In a large bowl, beat together the sugars and melted butter. 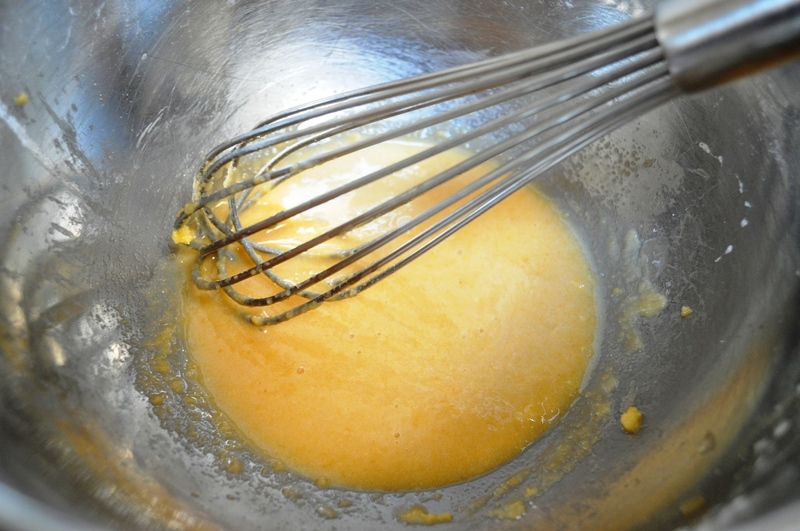 Add the egg, vanilla and pinch of salt and beat again to blend. 8. Add the nut meal, pear and chocolate to the bowl and combine. 9. Fold in the flour. 11. Bake for about 45 minutes, or until firm to the touch and lightly browned. 12. Cool in the tin for 10 minutes then turn out. Serve warm with cream2 or ice cream, or allow to cool completely. Hande had hers for breakfast. But then she lives in Rome and the sort of cake us Brits would treat as a tea-time treat or pudding gets eaten for breakfast there. 1 So yes, I’ve made a point of saying “unsalted butter” then added a pinch of salt. Why? Well, salt is essential for all foods, unless you have no sense of taste or somehow like your food bland. Put simply, it’s the ultimate flavour enhancer, so even sweets – especially sweets like this with a variety of flavoursome components – benefit from a bit of salt. A pinch. Too much and you may get a salty taste, but too little and it won’t be there to do its work. In the words of renowned London-based chocolatier and pâtissier Paul A Young salt “lifts and balances the sweetness and brings out other flavours.” I have used salted butter in cakes in the past, especially when I’ve not got any unsalted, but the problem with that is that you can’t control the quantity effectively as you can’t be sure how much salt is already in the butter. So it might seem perverse to use unsalted butter then add salt to the mix, but there’s a logic to it! 2 We had clotted cream. I could eat the stuff every day… if I was a bit more blithe about my arteries. Like so many Christian feast days, Mothering Sunday, or Laetare Sunday (from the Latin “rejoice”), may have its origins in pre-Christian celebrations. At the spring equinox the ancient Greeks celebrated the mother goddess figure they called Kybelis, who originated in what is today Turkey, but who migrated across the Mediterranean to become the Romans’ Cybele, with the feast day of Hilaria2. As they do, the traditions evolved and migrated further over history, but the “mother” aspect was retained, getting tweaked into signifying the “mother church” for Christians. 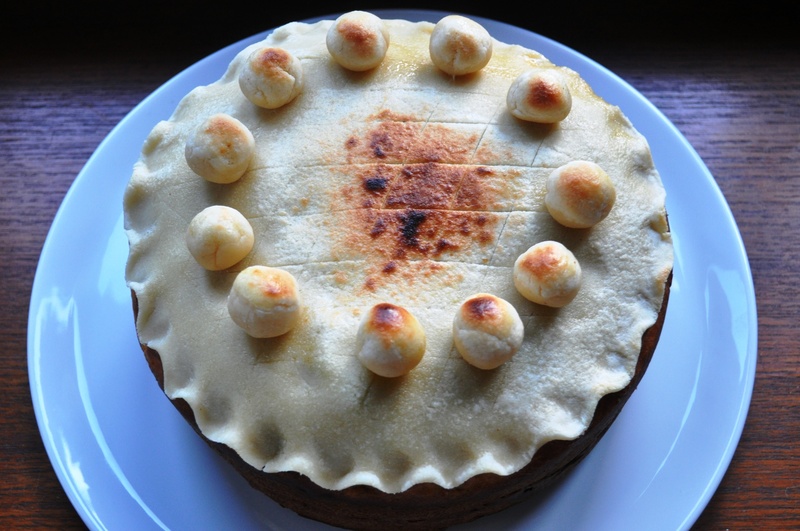 The tradition of eating something called simnel cake on this feast day emerged in Medieval England. Initially it was an enriched, yeasted wheat bread. 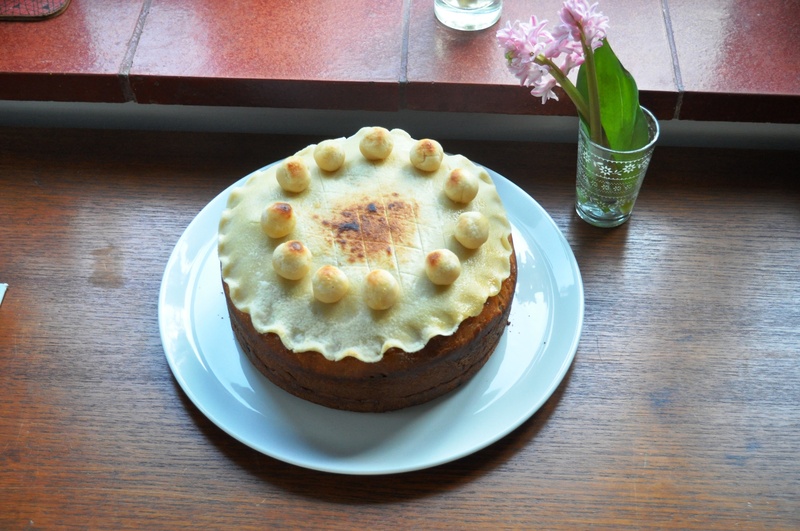 Indeed, the word simnel may derive – like the Scandinavian semlor – from the Latin simila: fine wheat flour. But no one is sure. The early modern versions, according to Mason and Brown, were a dough enriched with fruit, almonds and spices then “enclosed in a pastry crust and… boiled before being painted with egg yolk and baked, giving a very hard exterior.” Feast Day Cookbook by Katherine Burton and Helmut Ripperger mentions such a cake was so hard it gave “rise to the story of a lady who used one for years as a footstool”. In English Bread and Yeast Cookery, Elizabeth David writes “At one time simnel cakes were… baked with a layer of almond paste in the centre of the cake.” She they says they these were “gradually superseded by ordinary cake batters and the strip of almond paste or marzipan moved from the centre to the top of the cake, which was originally made for Mothering Sunday.” In the 19th century, servants and apprentices were allowed Mothering Sunday off to visit their families – and take a cake to their mothers. 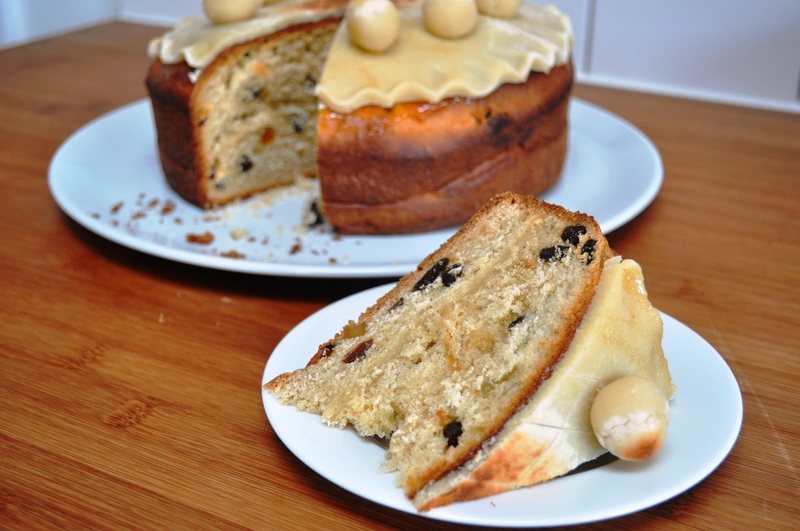 Burton and Ripperger describe simnel cake as “a yeast cake very yellow in colour because of the saffron and candied peel it contained”. I can’t find other mentions of saffron being an essential ingredient, though I suspect it would have been included in some parts of the country, possibly where saffron was cultivated such as Stratton in Cornwall or the famously named Saffron Waldon in Essex. Indeed, different parts of the country had their own variations, most notably the towns of Devizes (“which produced a star-shaped version without marzipan”3), Bury (“Where a rubbed-in mixture, giving a result rather like a very rich scone, was baked in a long oval”4), and Shrewsbury. This regional varation, still so common in countries like Italy, is something that was largely lost in the era of industrialisation, neutralisation and homogenisation that’s defined British food that past 70 or so years. The best known form today, developed from the Shrewsbury type, is decorated not just with a coating of marzipan but with 11 balls of almond paste. These balls represented Jesus’ apostles. Sometimes there are 12 balls – to include Jesus himself. Both counts exclude the notorious Judas. I feel somewhat sorry for Judas. Some poor sod was fated to be the fall guy right? Lowest circle of hell seems a bit harsh, especially if you believe his role was predestined. The final shift in tradition has occurred fairly recently. The cake is now largely made for Easter, and some prefer to see the balls as eggs. Easter eggs perhaps laid by the Easter bunny… Got to to love the mutability of tradition. This is a yeasted version. It’s a modernisation of the version in David. She based her version on one from Cassells’ Universal Cookery Book by Lizzie Heritage, published first in 1894. I wanted to incorporate both traditions of the marzipan layer in the middle and grilled marzipan balls on top. 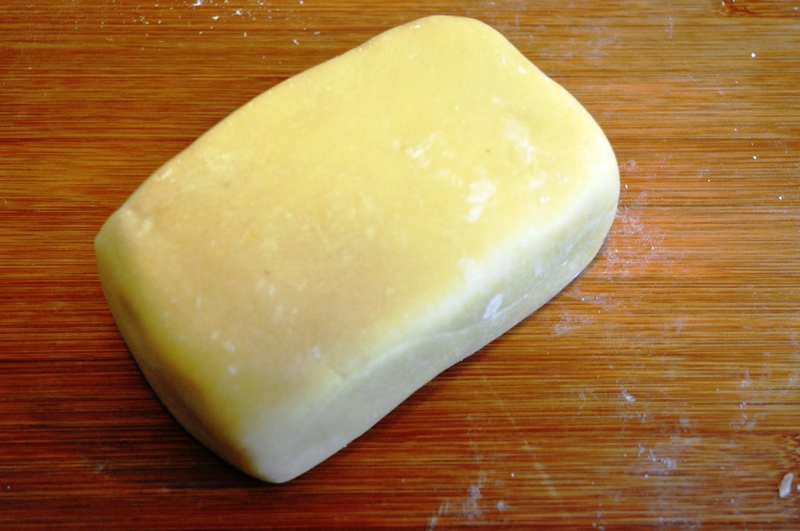 One batch of marzipan, about 400g-500g. See my recipe here. 1. First make your marzipan. You could buy some but it really is easy to make. 2. Grease a 23cm round tin, ideally springform. 3. Warm the milk slightly, then add the yeast (if using fresh or ADY) and a dessertspoon of the sugar. 4. Allow this mix to sit or until frothy and lively. 6. 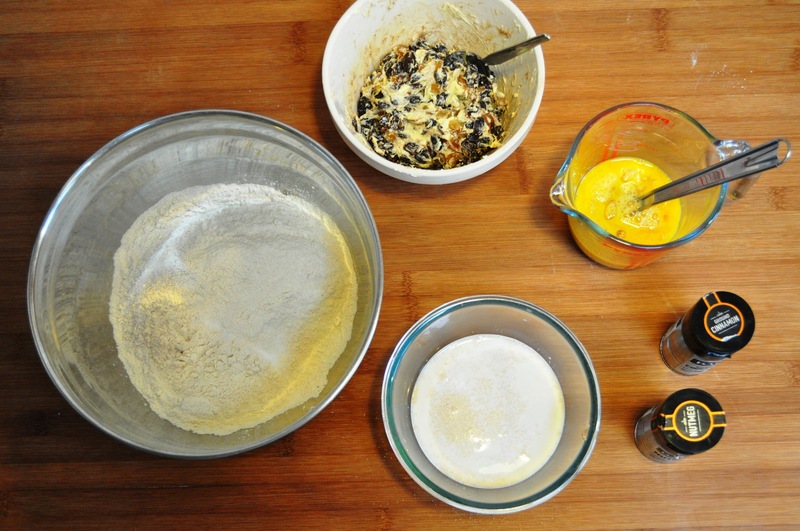 Bring to a dough, turn out onto an oiled or lightly floured work surface and knead until well combined. It will be quite sticky5, but try to use extra flour sparingly as adding too much extra will make for a dry, dense cake. 7. Form the dough into a ball, put in a clean bowl, cover and rest for about 10 minutes. 8. Give the ball another quick knead then allow it to rest again for another 10 minutes. Repeat this once more. 9. 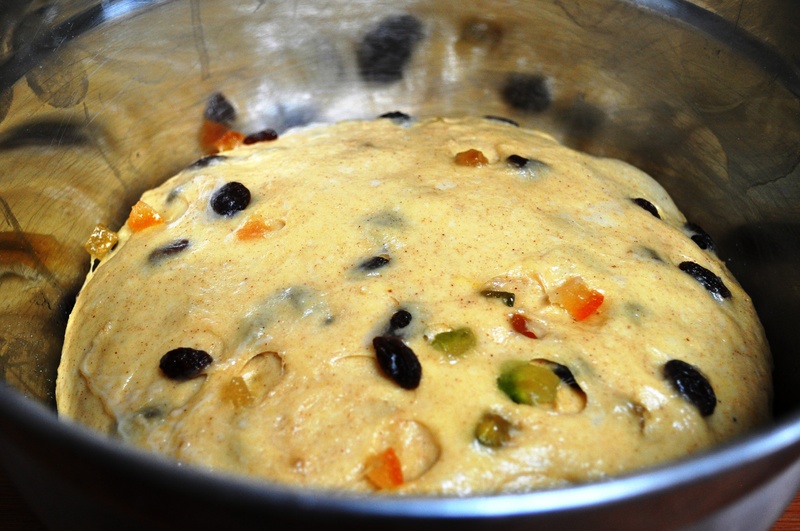 While the dough is resting, mix together the softened butter, fruit and spices. 10. 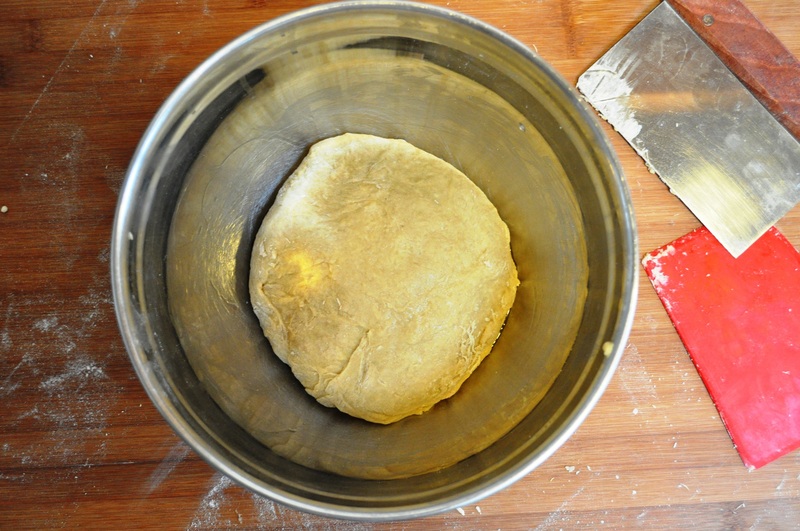 Take the dough out of the bowl and stretch it out. 10. 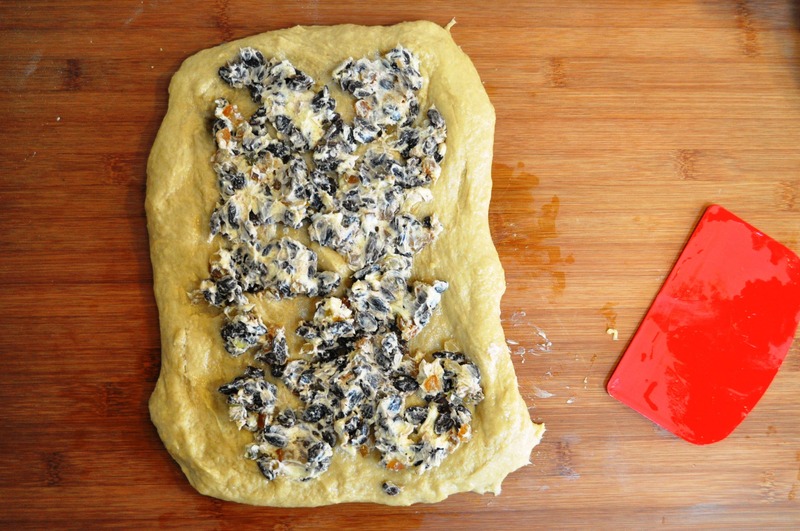 Smear the buttery fruit mix over the stretched out dough, then wrap the dough around and carefully knead it all together to combine. Again, it will be sticky, but try to be sparing with any extra flour. 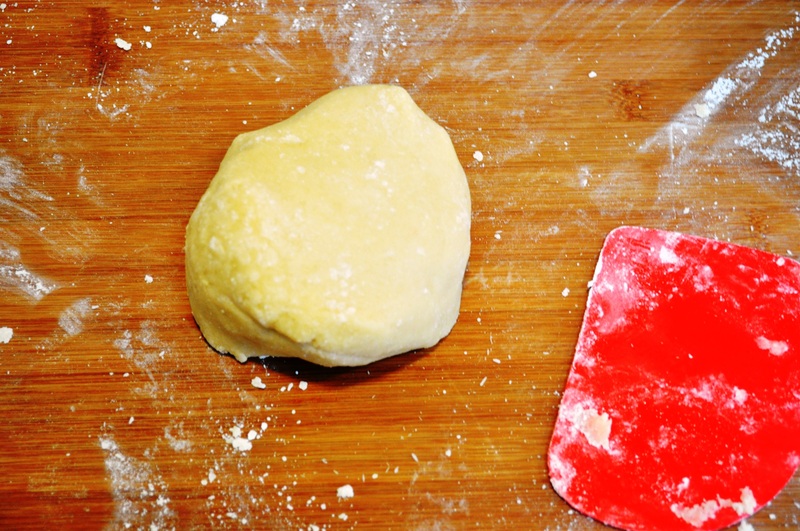 A dough scraper is your friend. 11. 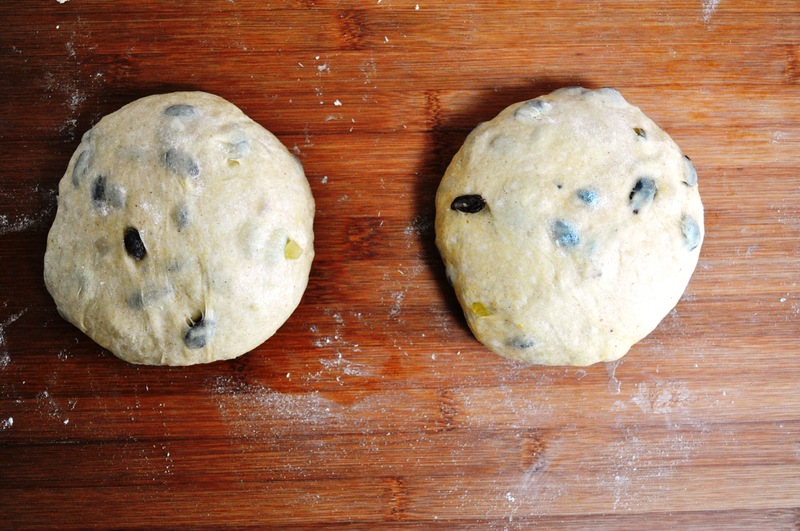 Form the dough into a ball again and put back in a clean bowl. 12. Cover and leave to rise, until doubled in size. 13. Take the dough out of the bowl. It should weigh about 1250g. Divide into two equal pieces, and form these into balls. 14. Leave the balls to rest for about 10 minutes, covered, then squash them down into discs. 15. 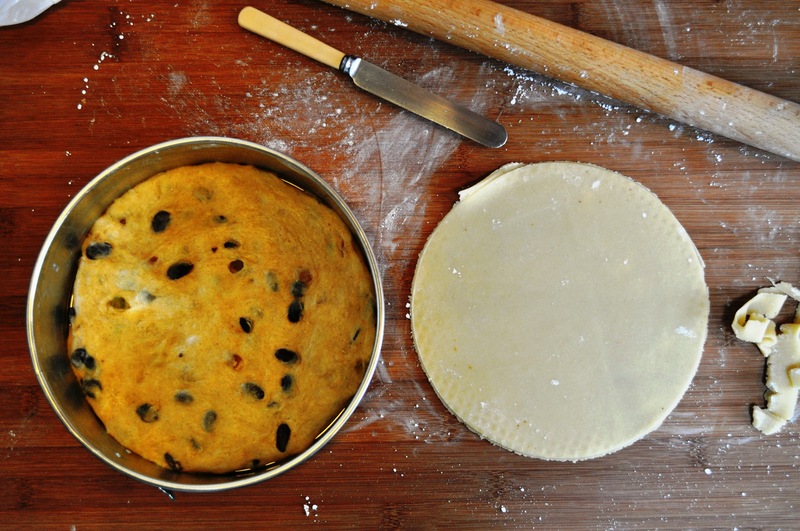 Put one of the discs of dough into the bottom of the tin and cover it with a disc formed of less than half of the marzipan, rolled and cut out, using the tin as a template. 16. Put the other disc of dough on top. 17. Cover and leave to rest again, until nearly doubled in size. 18. Preheat your oven to 200C. 19. Bake for about 20 minutes then turn the oven down to 180C. Continue baking for another 20-25 minutes. If the top starts to brown too much, cover it with foil. 20. Remove from the oven and allow to cool in the tin for about 10 minutes, then remove and cool completely. 21. When cool, brush the top with warmed apricot jam. 22. Roll out the marzipan, keeping a bit back, and make another disc for the top. Brush with beaten egg. 23. 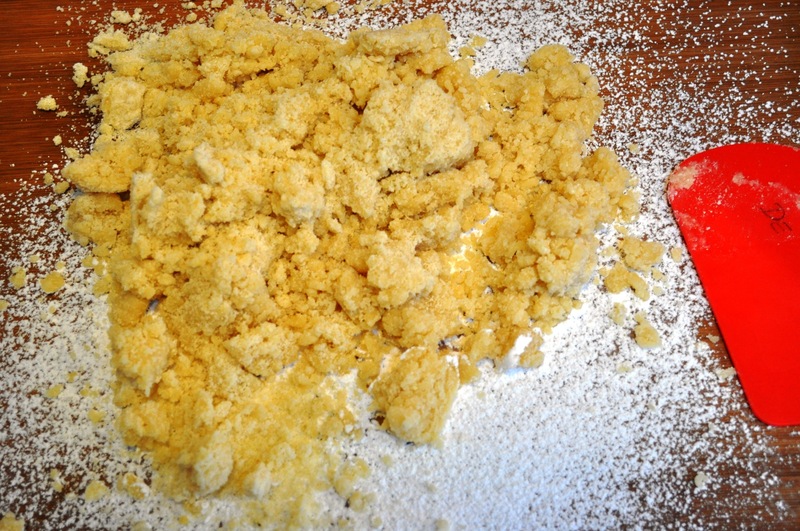 Use the remaining marzipan to make balls (mine weighed about 10g each), placing them in a circle on the top of the cake. Brush with more beaten egg. 24. Preheat your grill or light a blow torch, and brown the top marzipan and balls slightly. 25. 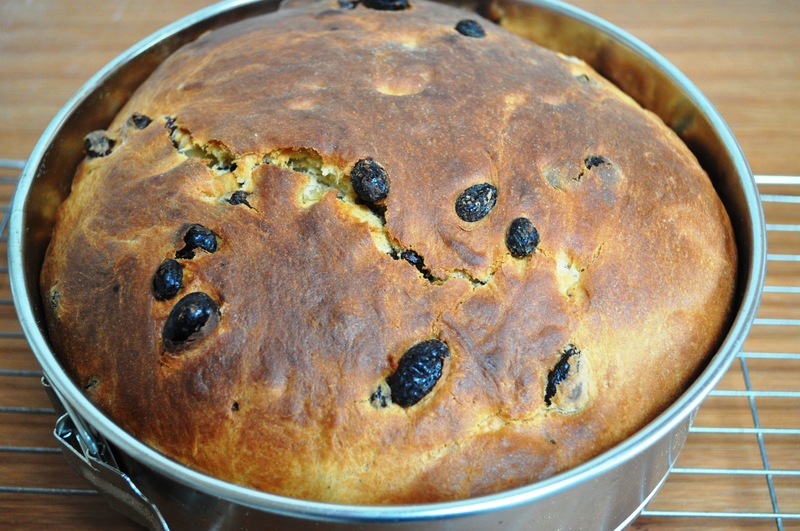 Take the cake to your mother, or enjoy with friends and family, hopefully welcoming the spring with a sunny day. 1. The Spring/vernal equinox itself, when the sun is over the equator and the lengths of day and night are roughly equal, isn’t until Friday 20 March 2015. In Western culture, its annual celebrations have been moved around between the date fixed by the ancient Romans, in the Julian calendar, then the later Gregorian Christian calendar, which most of the world uses today. Pope Gregory XIII introduced the latter because the date of Easter, which also takes it takes from the Spring equinox, was drifting and the Catholic church authorities wanted to recalibrate it. It’s quite a complicated issue, and still controversial among some Christians; read more here. 2. Hilaria means “cheerful” and relating to the modern English word “hilarious”. 3. and 4. Alan Davidson, The Oxford Companion to Food, p726 (2006 edition). 5. In terms of baker’s percentages, the 450g flour = 100%. So 180g milk = 40%. The beaten egg at 160g = 35%. So the hydration – treating the milk and egg combined as the total liquid – is 75%. 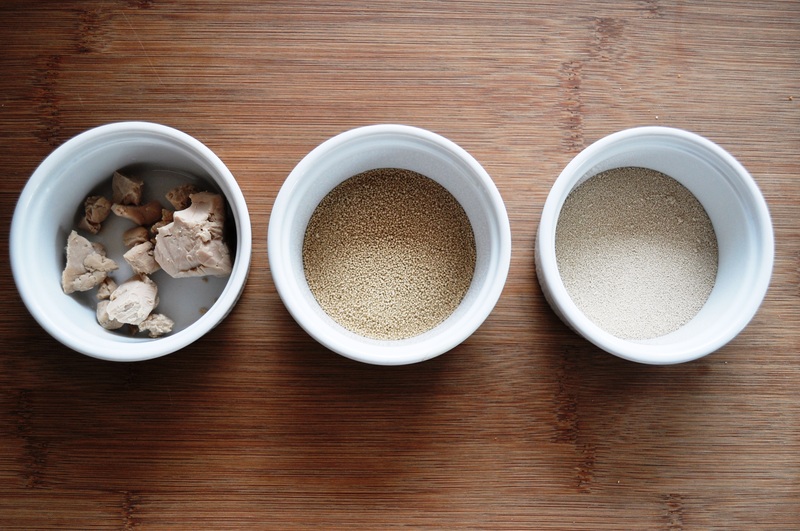 One of the awkward things about writing recipes for baked goods leavened with yeast is that there are three different types of yeast available commercially. Each has a slightly different quality, each is used in a slightly different way, and there are several different names to boot. It can make for some convoluted recipe ingredient lists. I wrote more here about the specific species of yeast that we use for foods and our relationship with them, but here I want to look at the types of commercial yeast and how you use them. Leaving aside sourdough / natural leavens / wild yeasts, the three yeast products in question are: fresh, active dry yeast and instant yeast. Also known as cake yeast, compressed yeast and, in Italian, lievito di birra fresca (fresh beer yeast), fresh yeast is my preferred form. It is strangely both squidgy and crumbly. In large scale bakeries, they may use 200g, 500g or 1kg blocks of the stuff, but for the home baker you may find it in 25g, 42g or 50g cubes or in the US I believe it comes in 2 ounce (57g) packs. Italian supermarkets stocked it, but most British ones don’t. I’ve heard that you can ask in in-store bakeries, but as these places are generally not actually bakeries – they mostly buy in pre-made dough and bake it off, rather than making it from scratch on-site – I doubt this. I get mine from a health food shop that sells it in 30g and 60g bags. You can buy it mail order easily enough (eg from Bakery Bits in the UK). 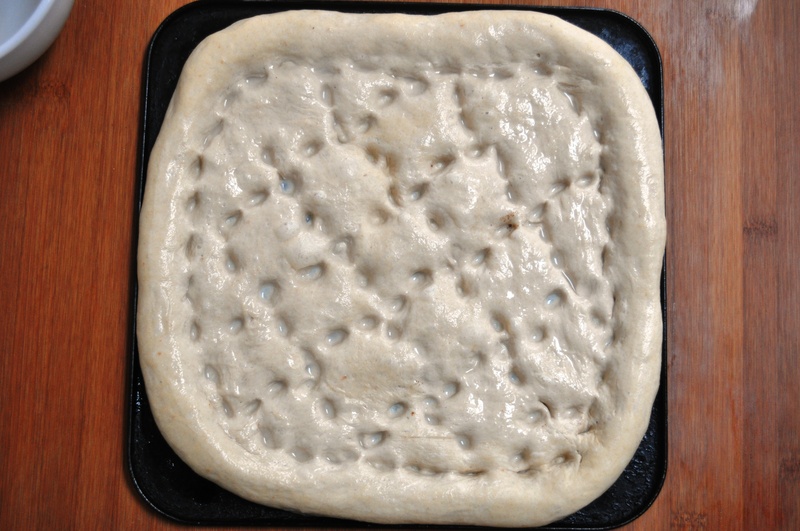 Using fresh yeast, typically you activate it in your liquid – water, or perhaps milk if you’re doing an enriched dough. If the liquid is tepid, the yeast will form a froth after a short while. I prefer to use mine like this as I feel it makes it easier to distribute it into the flour, but Breton-born, Britain-based baker Richard Bertinet, for example, simply rubs it in as you would to add fat to flour. I’ve done this, and it works fine. Fresh yeast is best stored in the fridge and will only last a few weeks, max. Then it’ll darken and go sludgy and not do you any favours. 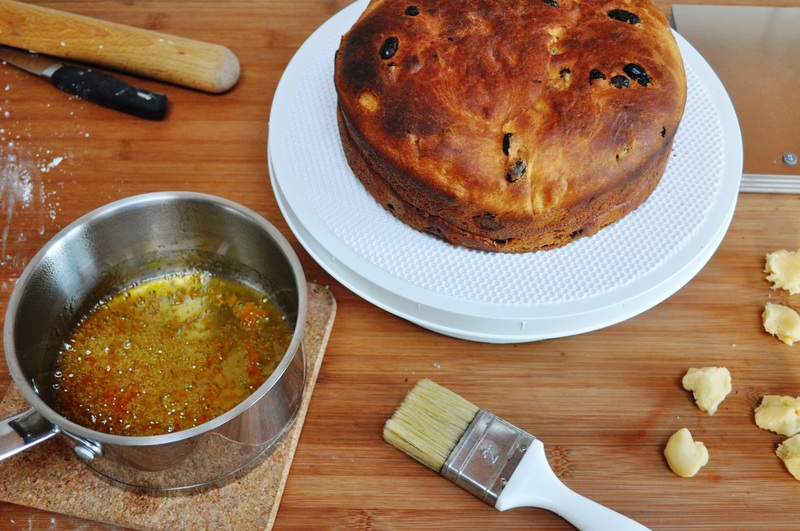 ADY was the baking yeast I grew up with – small granules that sat in the fridge door in a jar or orange tin. It doesn’t need to be stored in the fridge, but arguably that way it’ll last for months, possibly even years, as it’s pretty much inert, the live component encased within the shell of the granules. 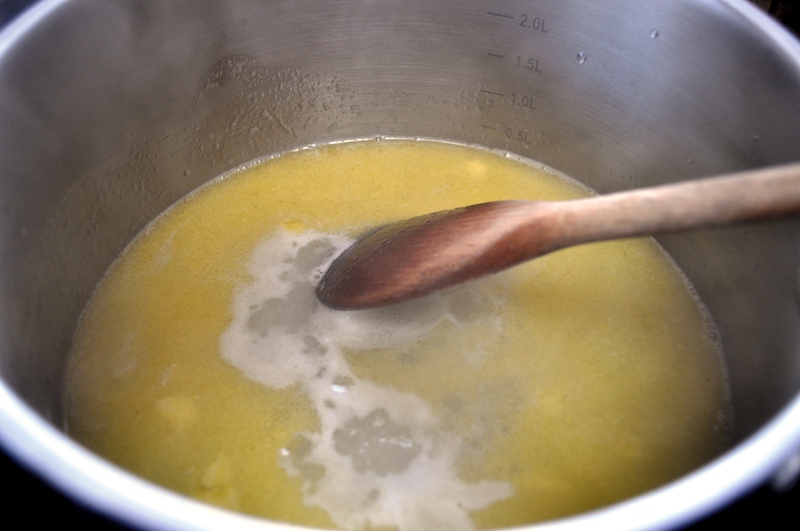 You do need to activate ADY to use it – again by adding it the liquid component of your recipe, and letting it froth up. Adding some sugar or honey to the liquid encourages this, as it gives the yeast some immediately accessible carbohydrates to start feeding on before it gets access to the carbohydrates in the flour. 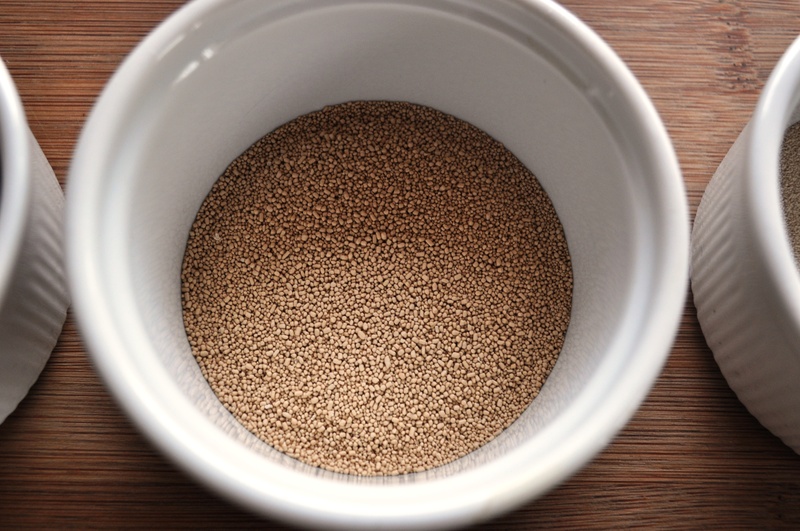 Also known as easy-blend, easy-bake yeast, fast action or quick, this is another type that can, confusingly, also be referred to simply as dry or dried yeast. It’s similar to ADY but is finer, almost powdery. I don’t tend to use this, it’s just not something I learned to bake using, or have a particular affinity for, but it’s probably the most commonplace type of yeast available these days. You can buy it in packs, such as these 125g ones from Dove’s Farm, but most typically you’ll find it in sachets of 7g (1/4 oz), which is about 1 1/2 teaspoons and is considered a convenient amount – you’ll often find recipes with 400g flour and 1 sachet, but recipes that rush the fermentation and proving times may do, for example, 500g and 2 sachets. The big difference when using instant yeast is that you don’t need to activate it or mix it with the liquid first – you add it directly to the flour. As with all these things, if you look around online no one is quite in agreement about how to convert quantities of the different types of yeast, but a good rule of thumb is to use half the weight of fresh if converting to ADY, and a third of the weight of fresh if converting to instant. 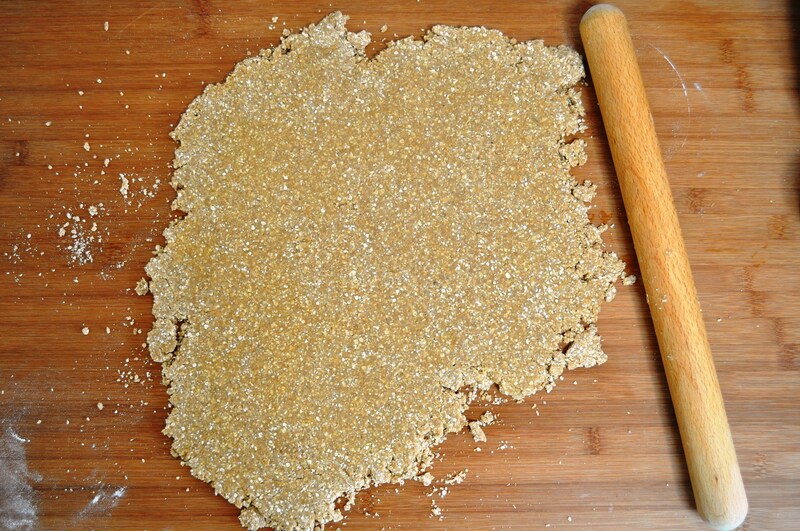 So for example, a recipe that calls for 20g fresh yeast you could replace that with 10g ADy or 7g instant yeast. Or as percentages where fresh yeast is 100%, ADY is 50% and instant is 33%. Of course, as you learn more about baking you’ll learn more about these variables – so for example, if you do a longer fermentation, you may be able to reduce the amount of yeast in a recipe and just leave the yeast to keep working. If you want a quick loaf (which I don’t recommend, because long fermentation = more digestible = less issues with wheat), a recipe may call for a much higher proportion of yeast. Brewer’s Yeast – made by “the brewer’s wife; and sold to the farmer’s wife at market, to which it was carried in earthenware jars.” This is what we’d call barm, and something I’ve experimented with thanks to a supply from my brewer friend Michele. 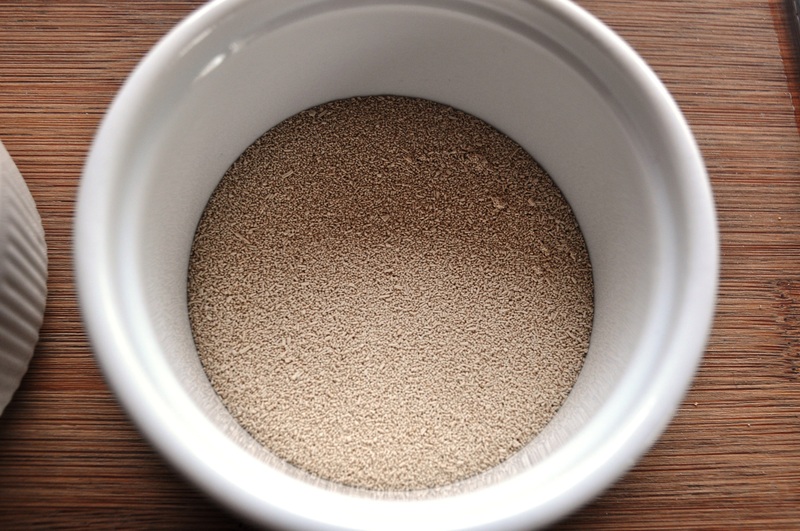 Dry yeast – for storage or use aboard ships, “made by spreading the yeast out on a wide board, and more on top, over and over, as it dired, till it was a couple of inches thick.” It was then cut into pieces and stored, then reactivated in warm water as we commonly do with fresh yeast. 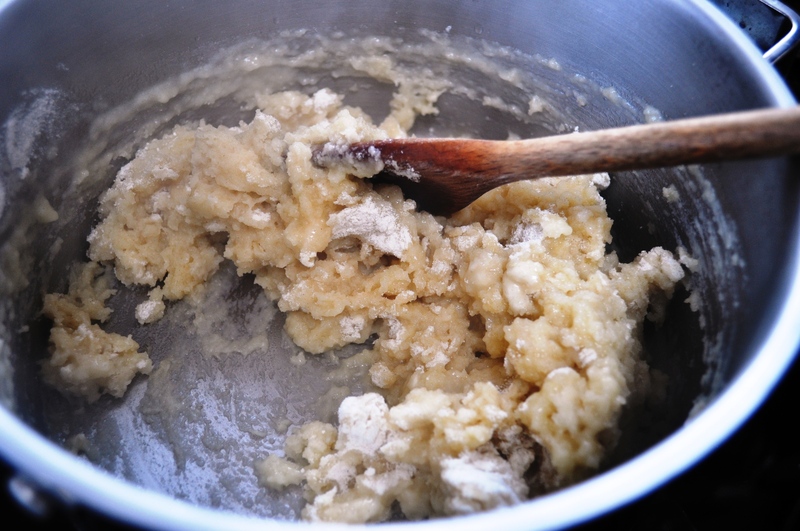 Potato yeast – potato boiled “and pounded up with some treacle and their own boiled water” with a little yeast added. So not really a type of yeast in itself, more of a medium. 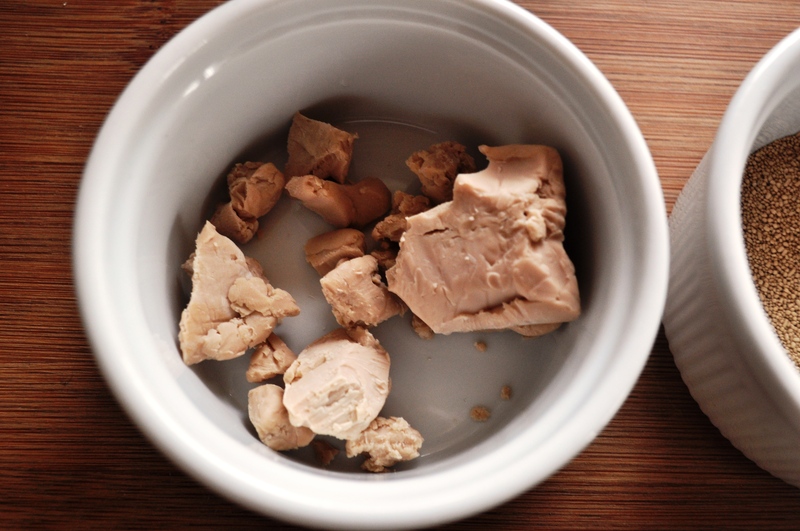 Although if left, such a mixture will develop its own wild yeast culture – this is the technique used for Maori rewena bread. Modern yeast – “obtained from a grocer will have a fresh clean smell, and be cool and firm.” She describes breaking it up and activating it in sweetened water, so it actually sounds like fresh yeast. * All these yeasts are industrially cultivated of course, fed sugars and pushed through a series of tanks, vats and fermenters, sealed to prevent any contamination from wild yeasts. But it’s a matter of degrees and where you prefer to draw your line as the number of additives in our foods increases, even in tiny incremenents. I strongly believe the ever-increasing industrial processing and additives in our food are responsible for so many health and dietary issues and disorders. When I was a kid in the 1970s, maybe one person in school (say 1%) had a food allergy or intolerance, now every second person has one. Take wheat – a lot of people have difficulties with it today, or believe they do, hence the proliferation of gluten-free products (many of them hideously industrially processed) and gluten-free baking blogs and books. I ardently believe, however, that for most people (not all) the problem is more likely to be with the industrial “food” product and the ingredients, not with the grain itself. Human civilisation was largely built on wheat, at least in the Middle East and Europe. If you eat a sandwich made of white sliced “bread” you may well feel bloated and sick; if you eat a sandwich made with real bread – made from just wheat, water, salt and yeast (better yet, sourdough) and fermented for at least five hours, preferably more – you may not have the same reaction. I stopped eating sliced industrial “bread” because it made me feel ill. This is what got me more interested in making real – really digestible, really nutritious – bread. Humanity developed the skill of converting wheat into a nutritous foodstuff by giving it a long fermentation: a form of processing. And not packing the bread with additives. Sliced industrial “bread” may only be fermented for 20 minutes and is packed with additives. Is it any wonder modern “food” is making people ill when we so readily reject knowledge garnered and honed over millennia in favour of hubristic chemistry experiments? This is my first recipe from the book Bread, Cake, Doughnut, Pudding by Justin Gellatly, formerly of St John now of Bread Ahead bakery, London. It’s a book I needed on my shelf, really, given the overlap with my area of interest – and the name of this blog. So thanks Rachel for the gift. 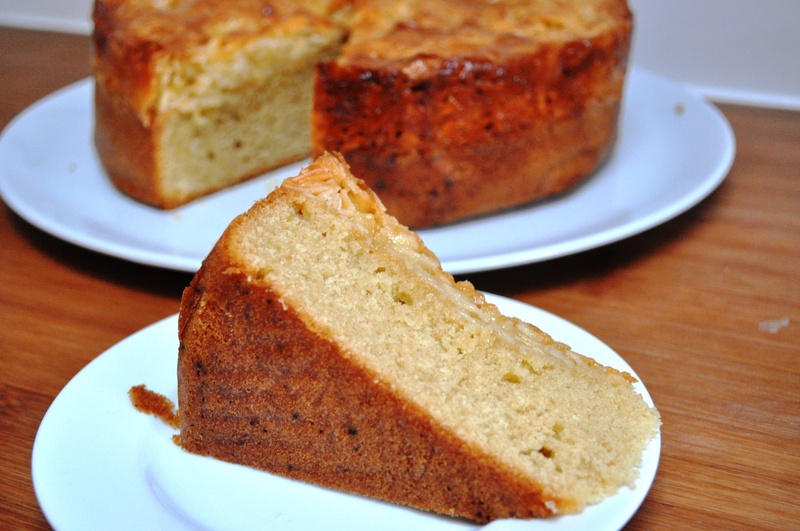 Gellatly lists this as Swiss almond cake, but I can’t quite bring myself to do that. 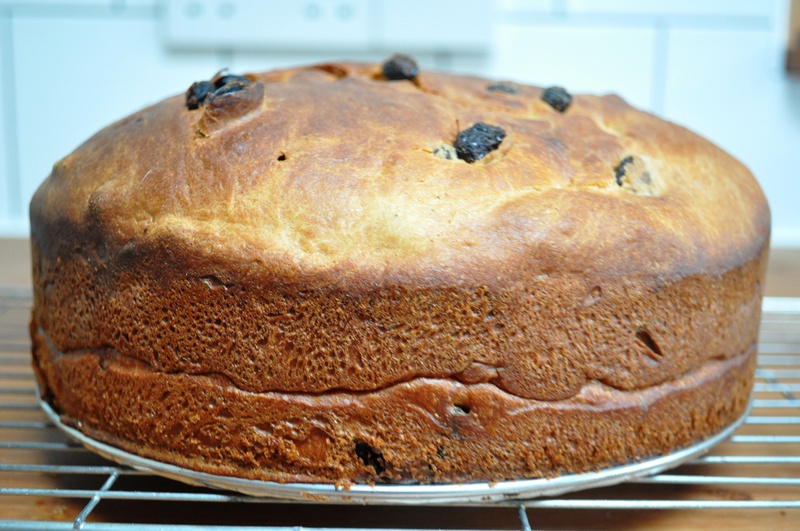 Thing is, I’m sure this is a version of toscakaka – a Swedish almond cake (here’s a version on Poires au Chocolat). Either way, it’s delicious. 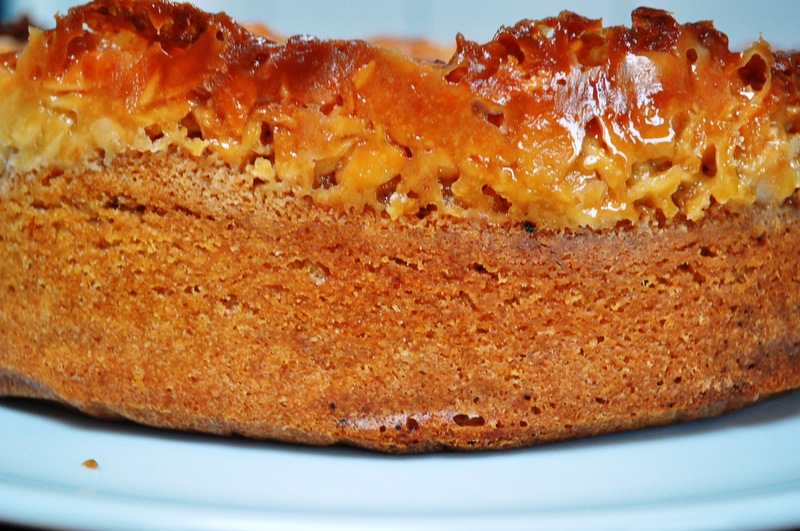 A huge, almondy beast with an absurdly rich, crunchy, buttery almond topping. 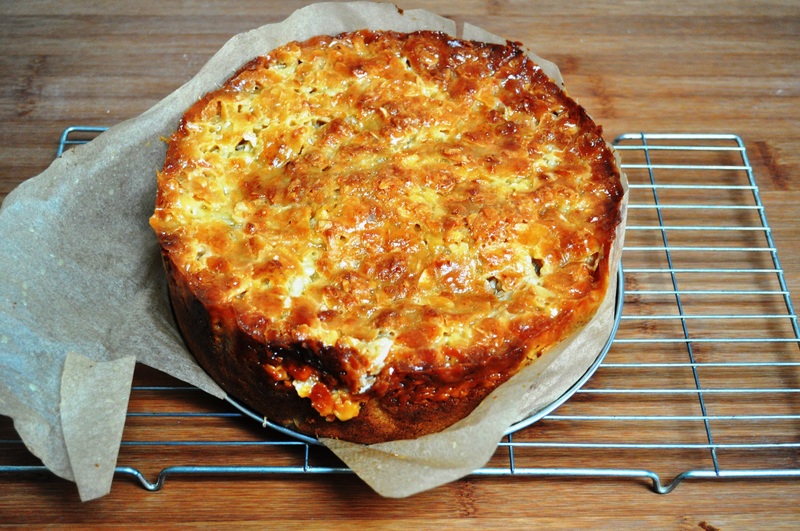 As with the classic toscakaka, you partially bake the batter, then add the topping, then continue baking. 1. Grease and line the base and sides of a 26cm springform cake tin. 2. Preheat the oven to 160C. 3. 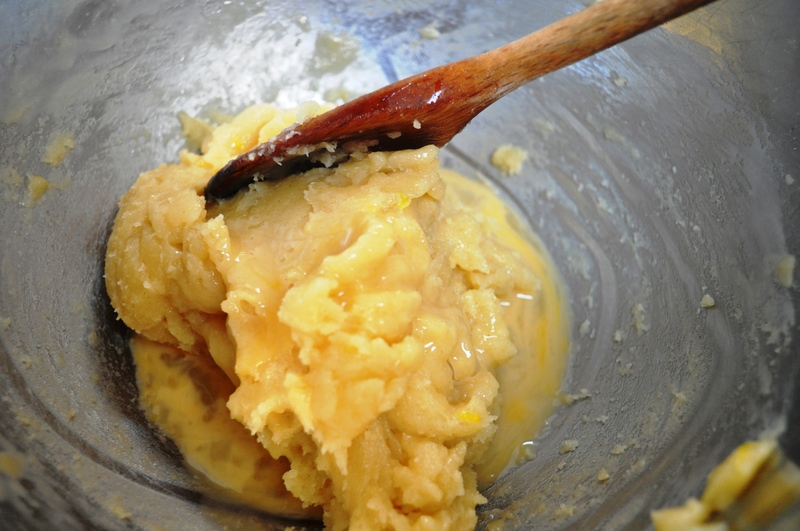 Make the topping mix by gently heating together the butter and sugar in a saucepan. When melted, add the milk, flour, ground almonds and flaked almonds and stir to combine. Put aside. 4. 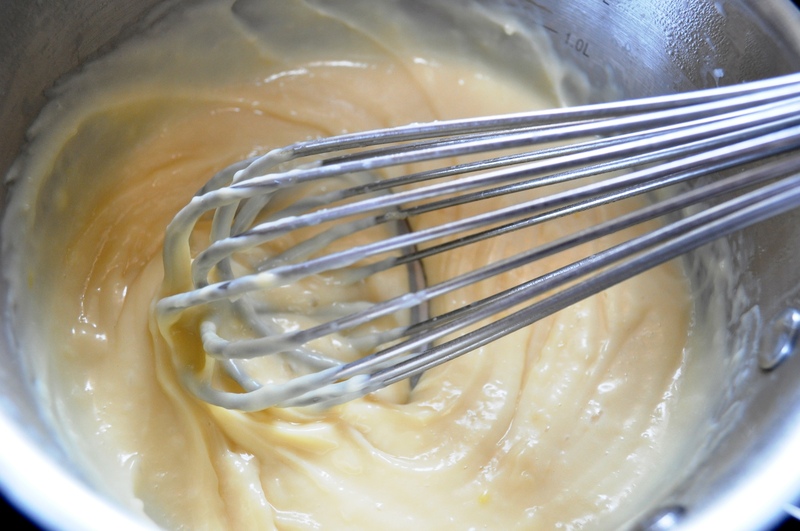 Make the cake batter, starting with melting the butter. 6. Beat in the melted butter, then the cream and essence (or extract!). 7. 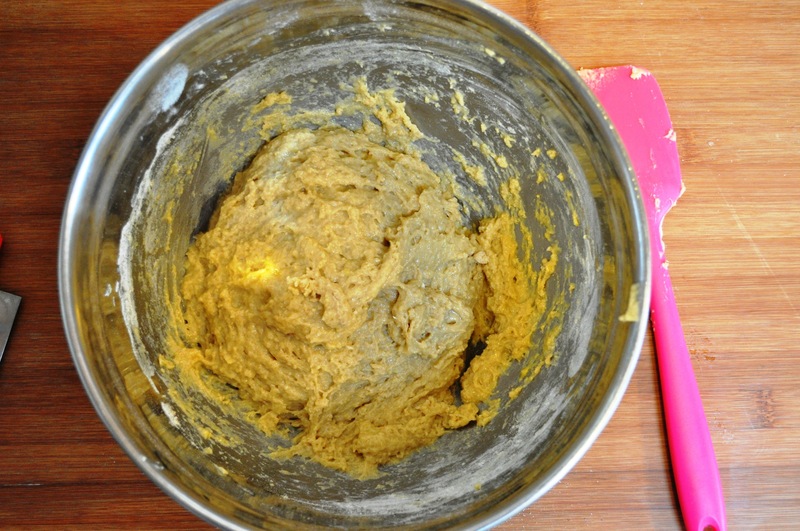 Sieve together the flour and baking powder then fold this into the batter. 8. 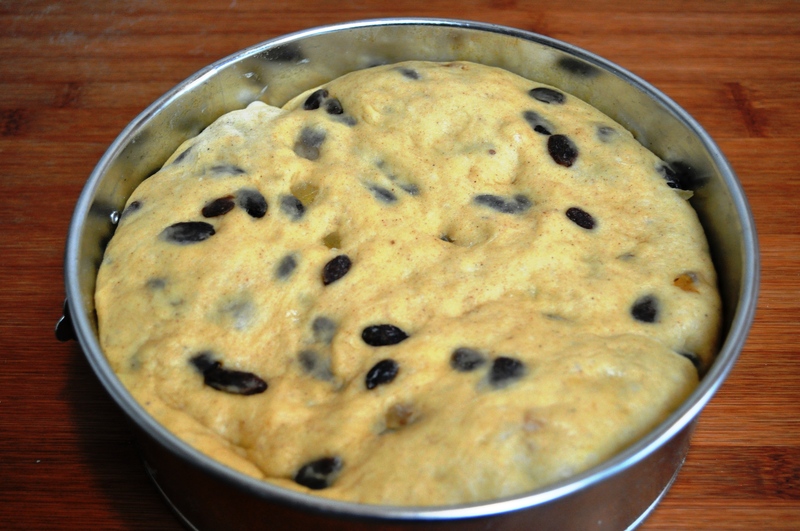 Pour the batter into the cake tin, then bake for 25 minutes. 9. Carefully take the cake out of the oven, and gently spread the topping on. 10. Increase the heat of the oven to 180C then put the cake back in and bake for another 40 or so minutes. It’s tricky to judge when this cake is done, as the skewer may come out of the cake itself clean, but the topping will still be smeary. You want the topping itself to be browned nicely. 11. Cool in the tin for 20 minutes then remove and either serve warm with cream or whatever you fancy, or allow it to cool completely. Oh, and you might want to invite friends over to help you as it is substantial. The best bit is the edge of the topping where it’s caramellized against the tin. Good stuff, thank you Mr Gellalty.